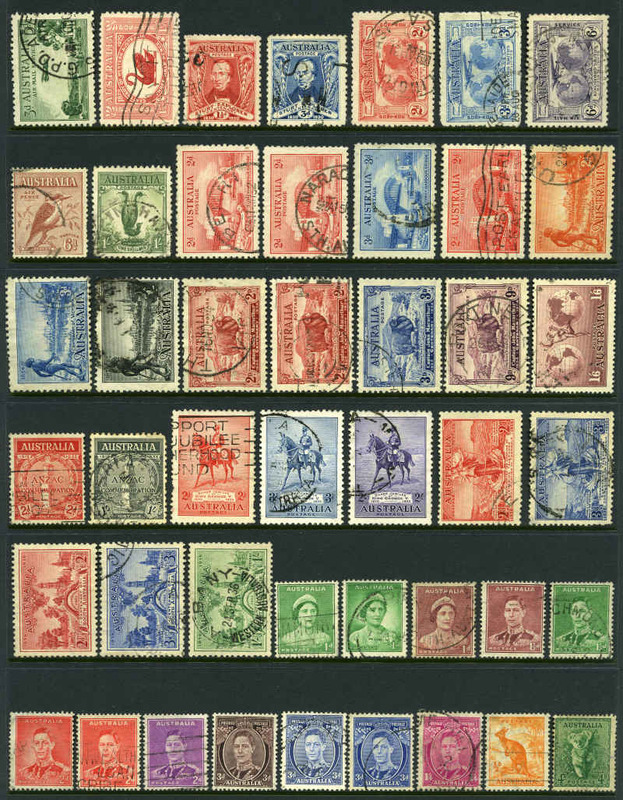 Collection of hundreds of KGVI period issues from 1937 to 1952, mixed MUH and MLH in singles, pairs and blocks including many imprints, duplicates and range of varieties in Favourite loose leaf album. 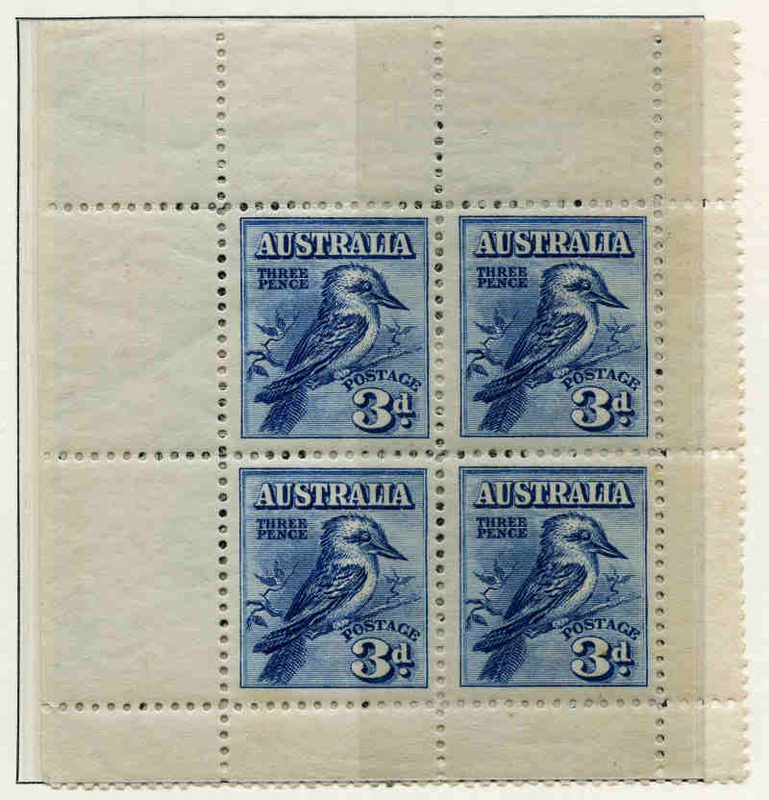 Noted 1937 1/6 Thick Paper Hermes Ash and McCracken imprint blocks of 4, 1937 6d Perf 13½ Kookaburra No Imprint corner pair, 1938 1d Green Die II Queen Mother Flush Perf imprint block of 4, 1938-41 1½d Brown Perf 13½ and 14¾ KGVI imprint blocks of 4, 1938 1/4 KGVI imprint block of 4 with Flaw on "A" of "Australia" variety (4), 1941 2d Mauve KGVI with Inverted Wmk and corner block of 8 with "Medallion" flaw, 1941 3d Brown KGVI Authority imprint block of 4 (5) showing progressive flaw on lower left stamp caused by foreign matter on plate during printing, 1941 5½d Surcharge (40), 1942 3½d Blue KGVI Flush Perf imprint block of 4 with "White Face" variety, 1948 1/3 Bull imprint block of 4 (5), 1948 2/- Wmk Crocodile imprint block of 4 (6), 1949 1/6 Wmk Hermes block of 30 and 1951 2d Green Queen Mother No Imprint corner block of 4. Most blocks lightly hinged on top units. 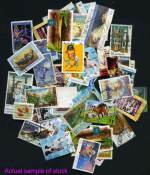 Accumulation of 400 used higher value 60¢ to 90¢ commemorative stamps from 1980's and 1990's. Good range with some duplication. Mainly fine condition. 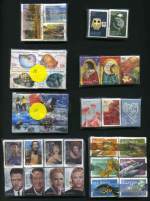 Accumulation of fine used higher value $1.00 to $2.45 commemorative stamps from 1980's to 2000's. Good range with varying duplication. Some CTO with GPO Melbourne cancel. Face Value $$400.00. 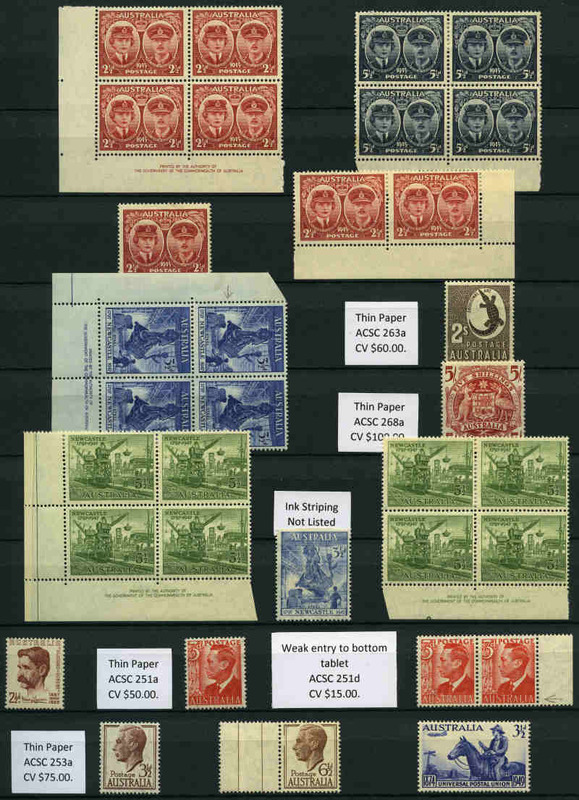 Accumulation of 6,340 MUH low value Pre-Decimal issues from 1937 to 1965 in singles, blocks, part sheets and sheets including many duplicates. Noted 1951 2d Green QEII coil perf sheet of 160 (2, one without imprints), 1953 3d Green QEII coil perf half sheet of 80, 1962 2d Brown QEII Non Helecon coil perf sheet of 180. Odd minor blemish. 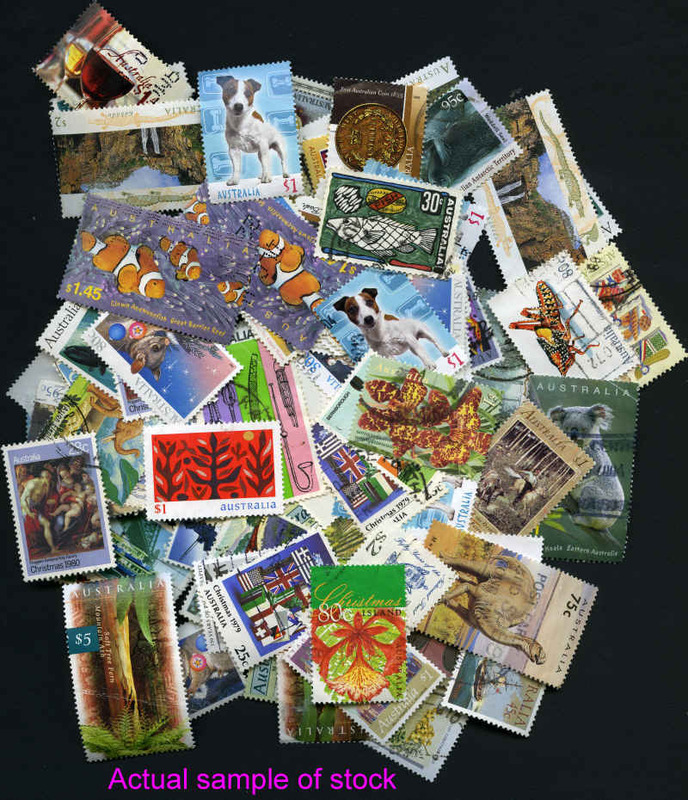 Accumulation of many thousands of mostly Decimal used stamps off paper in shoebox. 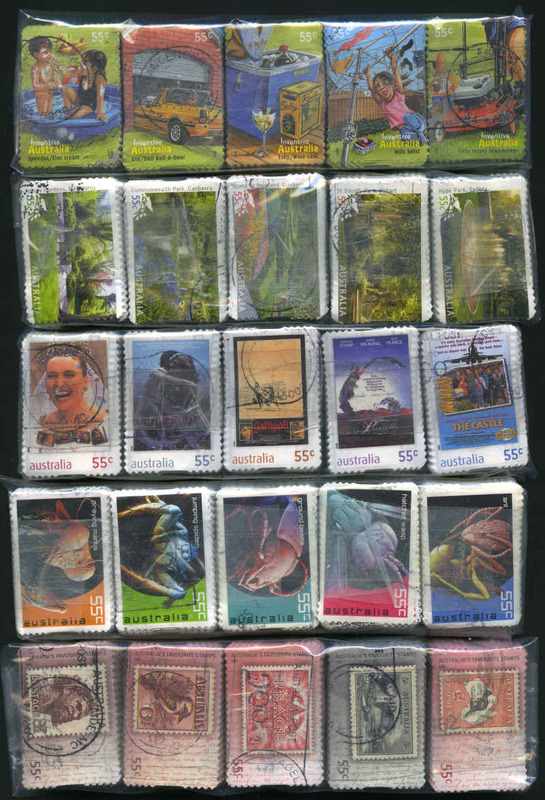 Accumulation of hundreds of stamps CTO with gum including numerous higher values, duplication and some Australian Antarctic Territory and Christmas Island. 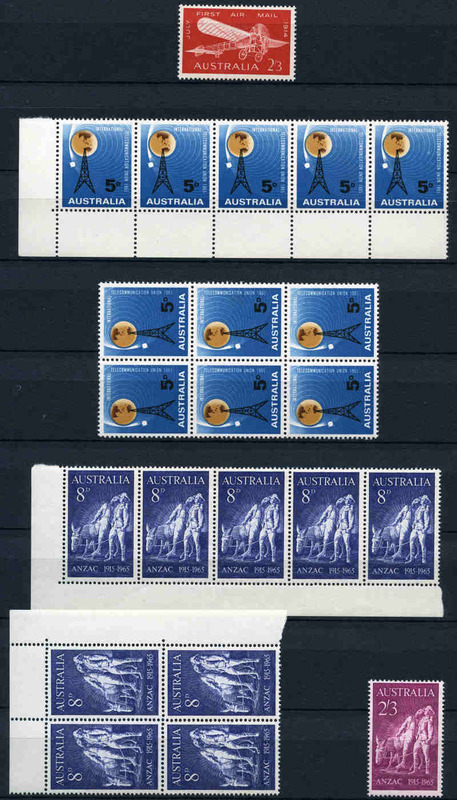 All cancelled with printed Melbourne postmarks. Face Value $693.00. 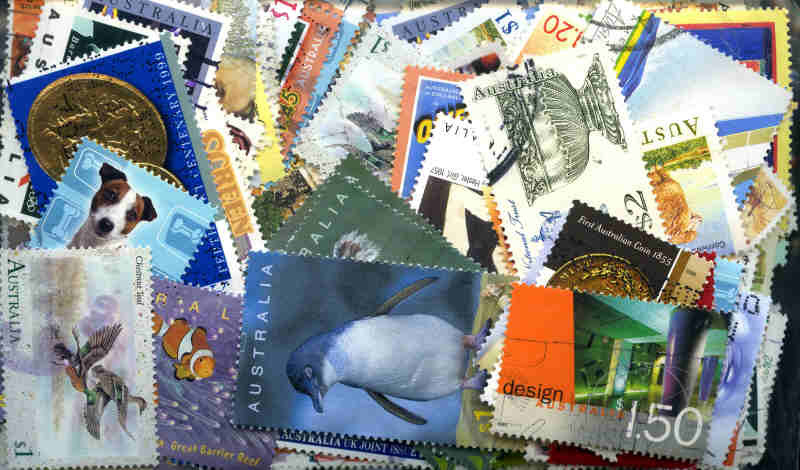 Accumulation of 1,000 mainly modern above letter rate stamps off paper. 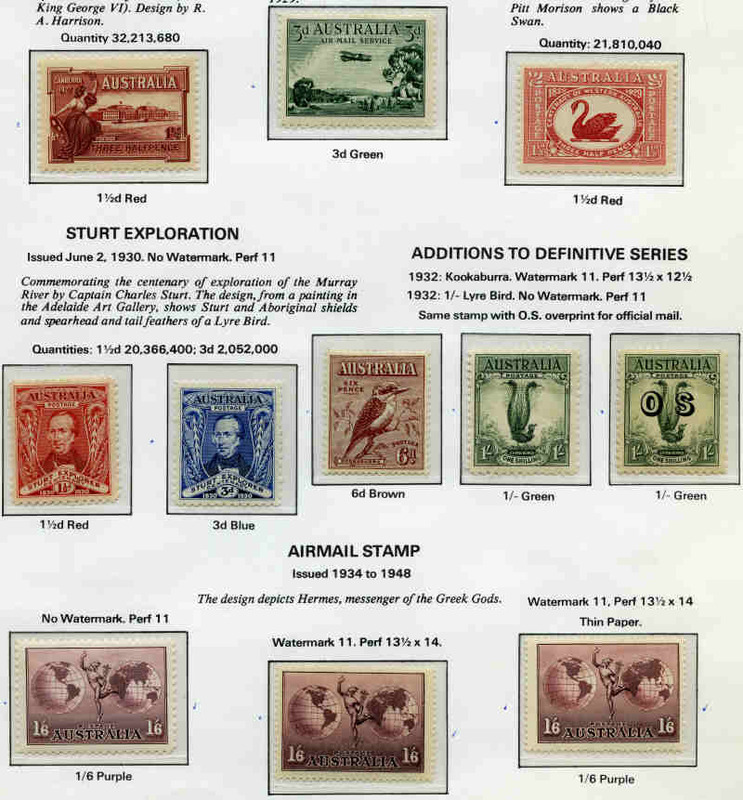 Mainly commemorative issues with some $5.00 definitive issues. Some faults. 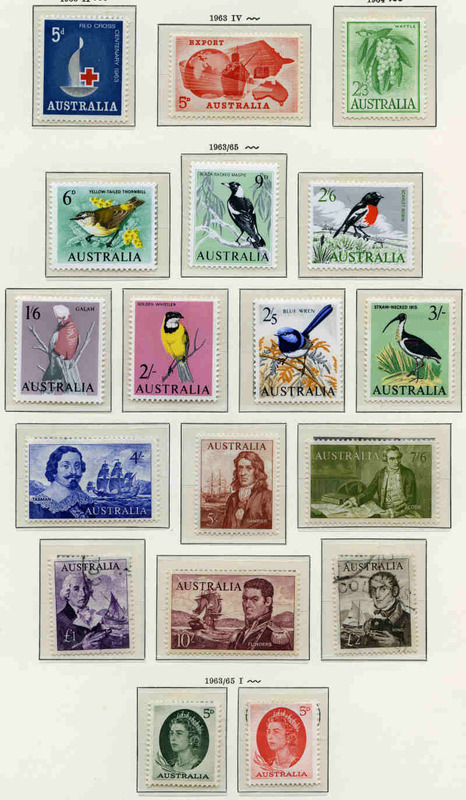 Accumulation of 40,000 Decimal commemorative stamps in mostly mixed bundles of 100 including some Australian Antarctic Territory. Main strength in 1980's. 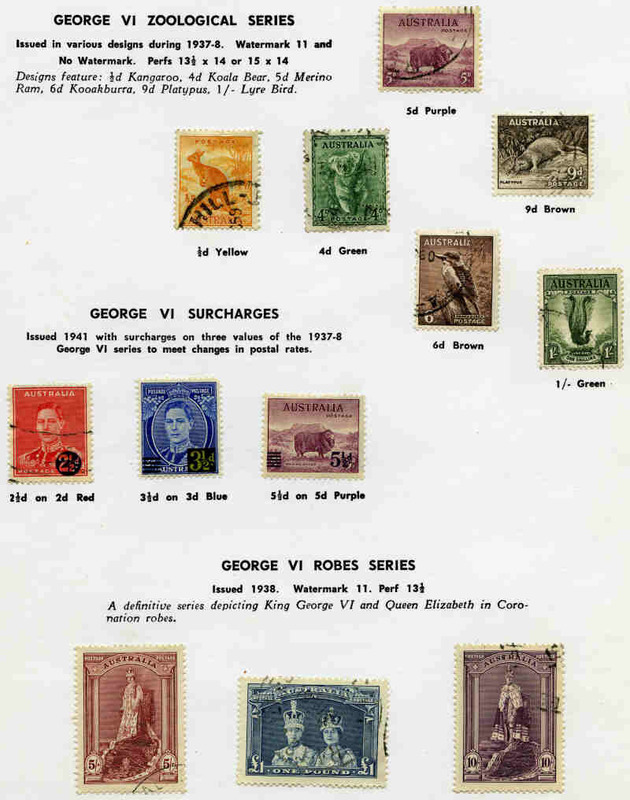 Collection of used Kangaroo, KGV and Pre-Decimal stamps from 1913 to 1965 including handy range of better issues. Noted 1916 £1 Brown and Blue 3rd Wmk Kangaroo with barely visible repaired perf at base, 1932-35 10/-, £1 and £2 C of A Wmk Kangaroo's (10/- lightly creased), 1935 Silver Jubilee set, 1938 Thick Paper Robe set, 1949 Arms set and 1963-64 Navigator set. Mainly good to fine used with usual variable condition. 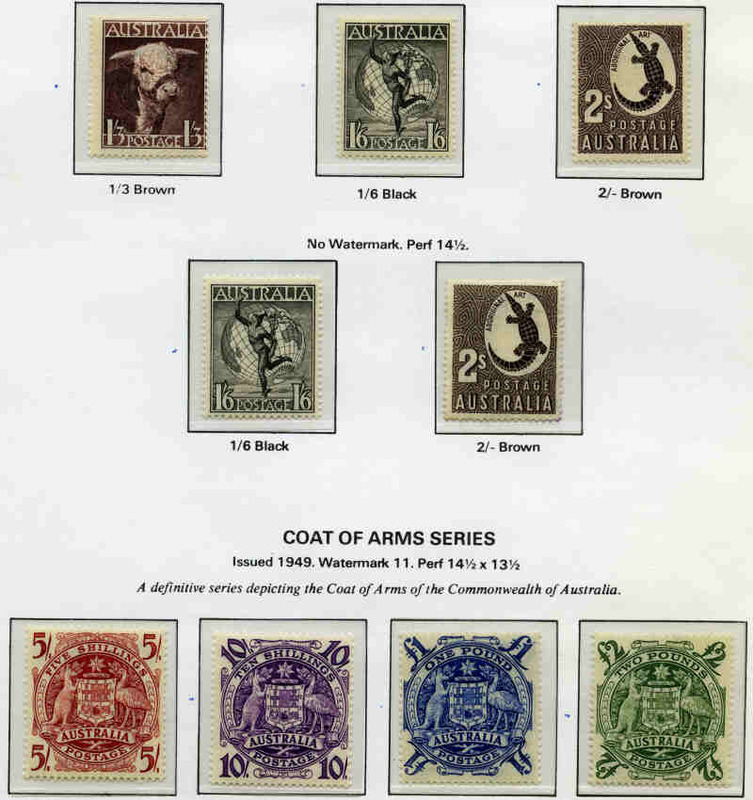 Accumulation of hundreds of mostly used Kangaroos, KGV and Pre-Decimal stamps including 1931-33 C of A KGV set O/P OS (2, plus MLH set), 1938 Thick Paper Robe set (2), 1949-50 Arms set (2), 1964 £2 Navigator, plus set to £1 MUH and many other handy issues. Generally fine with some faults and varying duplication. 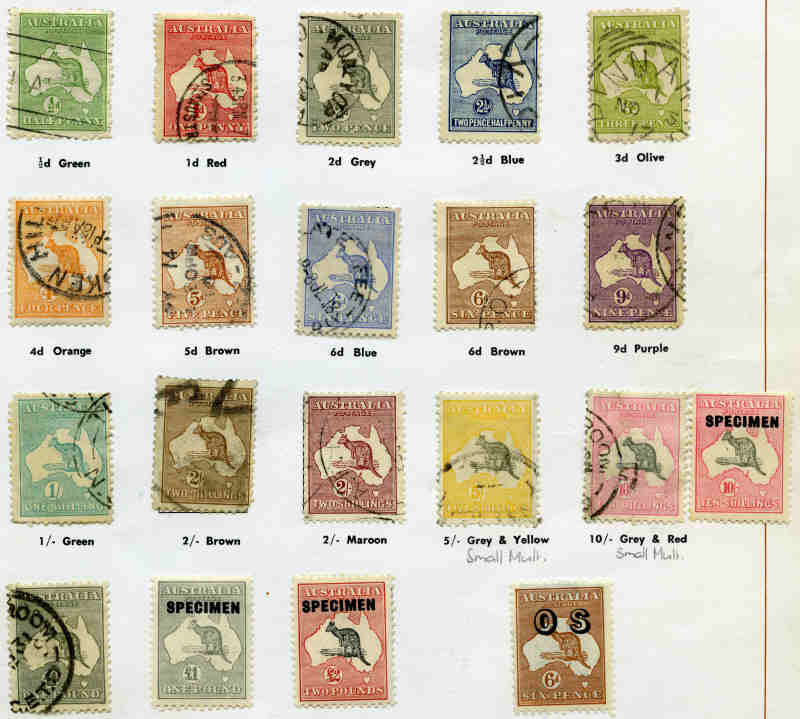 Collection of mint and used stamps from 1913 to 1978 including 1924 £1 Grey 3rd Wmk and 1929 10/- Grey and Pink Small Mult Wmk Kangaroos with repaired telegraph punctures used, 1932-35 C of A Wmk Kangaroo set O/P Specimen Type D MLH, KGV set to 1/4 value including OS overprint issues used, 1914 6d Claret Kooka CTO, 1928 3d Kooka M/S MLH (tiny thin), 1931 2d and 3d Kingsford Smith O/P OS CTO, 1931 6d Brown Airmail GU, 1931 6d Brown Airmail O/P OS, 1932 1/- Lyrebird O/P OS FU, 1932 5/- Green Sydney Harbour Bridge FU (thinned), 1934 Vic Centenary set used, 1934 Macarthur set used, 1935 Anzac set used, 1935 Silver Jubilee set used, 1938 Thick Paper Robe set FU, 1949-50 Arms set FU, 1963-64 Navigator set FU and complete mint Decimal including 1971 Christmas block of 25 in Seven Seas Standard album. Some generally minor faults. 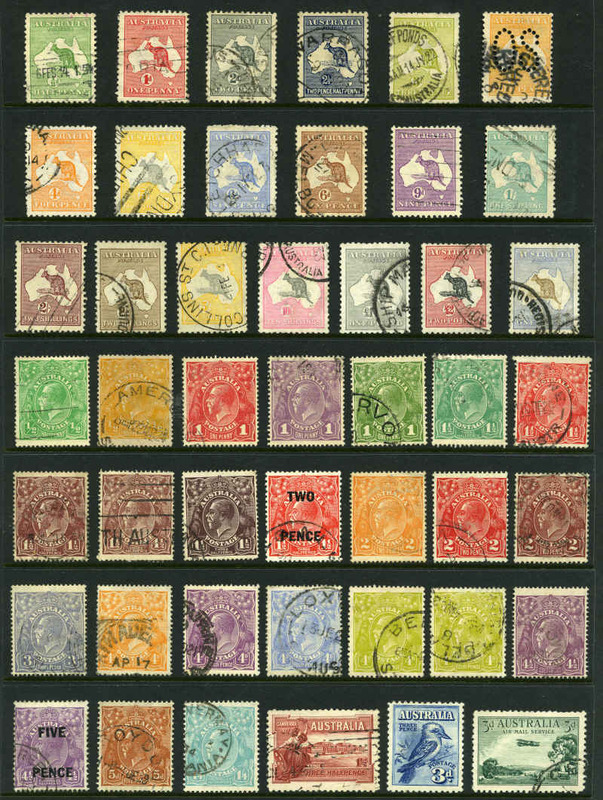 Collection of 285 different mint Pre-Decimal issues from 1914 to 1965 on Seven Seas Hingeless pages. 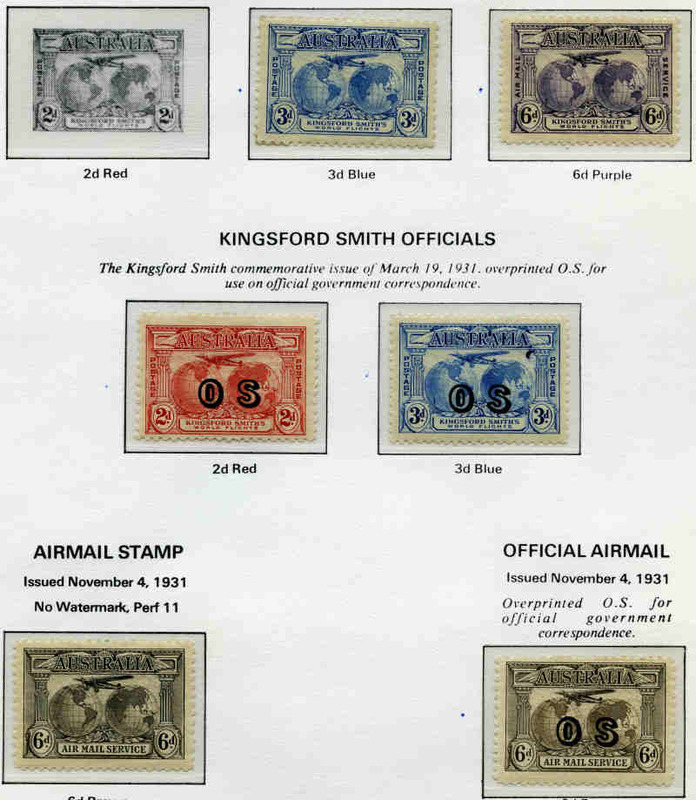 Includes 1914 6d Claret Kooka, 1928 3d Blue Kookaburra M/S, 1931 2d and 3d Kingsford Smith O/P OS, 1931 6d Brown Airmail O/P OS, 1932 1/- Lyrebird, 1932 1/- Lyrebird O/P OS, 1932 5/- Green Sydney Harbour Bridge (light toning), 1934 Perf 10½ and 11½ Vic Centenary sets, 1934 Macarthur set of 4, 1934 1/6 No Wmk Hermes, 1935 Anzac set, 1935 Silver Jubilee set, 1936 SA Centenary set, 1937 NSW Sesqui set, 1937-40 3d Blue Die I, Die 1A, Die II Thick and Thin Paper and Die III KGVI, 1937-38 Perf 13½ Zoological set, 1938-49 Thick and Thin Paper Robe sets, 1940 AIF set, 1949-50 Arms set (£2 creased), 1961-64 5/- Cream and White Paper Cattle and 1963-64 Navigator set of 8. Generally fine MLH condition with some minor faults. High retail value. 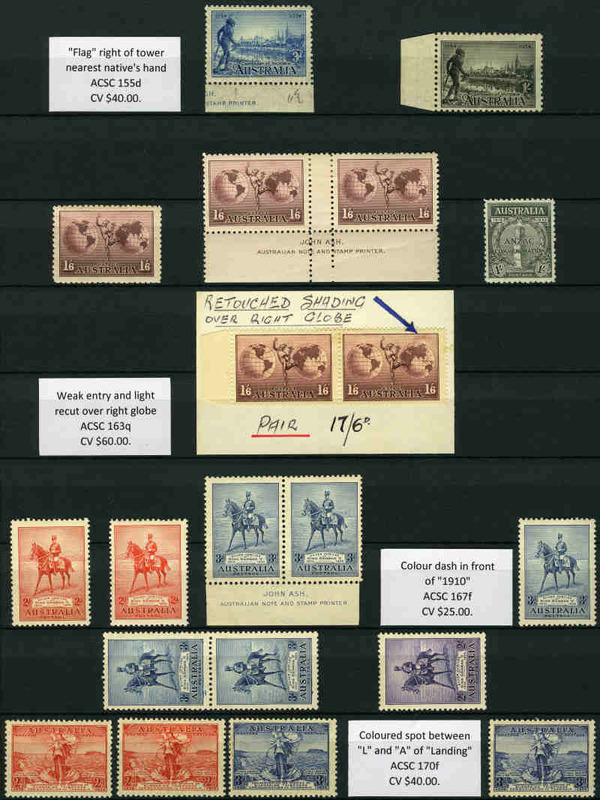 Collection of used Pre-Decimal and Decimal stamps from 1914 to 1983 in Seven Seas Standard album. 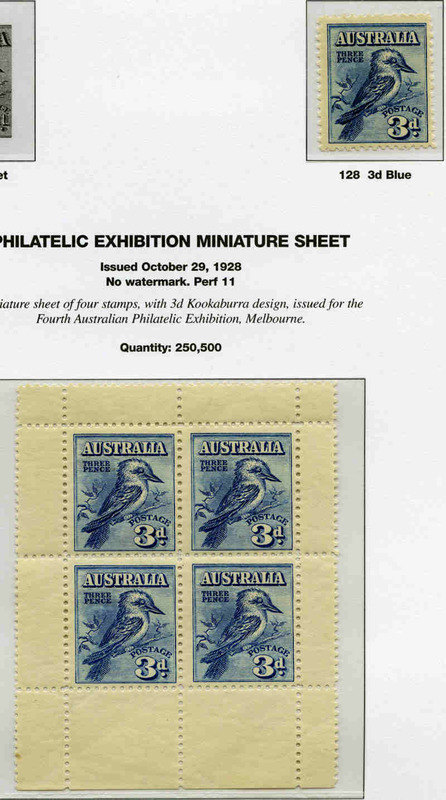 Includes 1914 6d Claret Kooka, 1928 3d Blue Kookaburra M/S CTO with gum, by blue exhibition cancellation (small thins at top, but attractive appearance), 1931 2d and 3d Kingsford Smith O/P OS CTO, 1931 6d Brown Airmail O/P OS, 1932 1/- Lyrebird O/P OS, 1932 5/- Green Sydney Harbour Bridge CTO with gum, 1934 Perf 10½ and 11½ Vic Centenary sets, 1934 Macarthur set of 4, 1935 Anzac set, 1935 Silver Jubilee set, 1938-49 Thick and Thin Paper Robe sets, 1949-50 Arms set and 1963-64 Navigator set of 8. Generally good to fine used condition with some minor faults. High retail value. 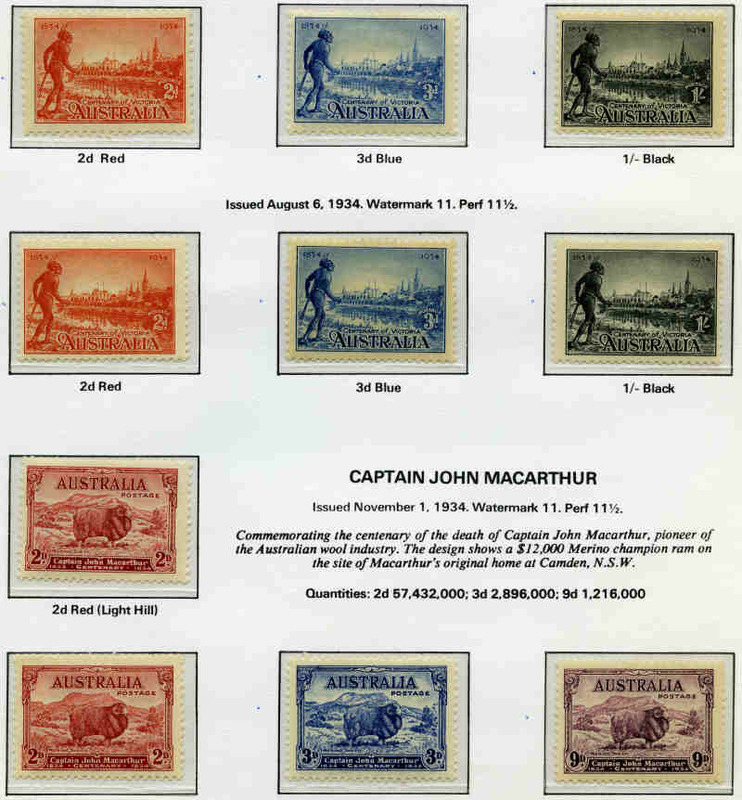 Collection of mint Pre-Decimal issues from 1914 to 1965 in singles, pairs and blocks including range of varieties in Lighthouse stockbook. 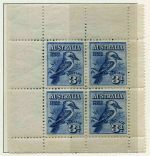 Noted 1914 6d Claret Kookaburra MUH, 1929 1½d WA Centenary block of 4 with Re-entry to swan's neck and "TR" of "Australia" variety MLH, 1934 1/- Perf 10½ Vic Centenary MUH, 1934 1/6 No Wmk Hermes single, plus imprint pair MLH, 1935 1/- Anzac MUH, 1935 Silver Jubilee set, 1936 1/- SA Centenary MUH, 1938 1d Die II Queen Mother "White face" MLH, 1938 £1 Thin Paper Robe MUH, 1941 3d Brown KGVI "White face" MLH, 1949 5/- Arms Thin Paper MLH, 1950 1½d Green Queen Mother corner block incorrectly guillotined causing upper sheet imprint to be present at top left and other handy items. Odd minor fault and mixed centering. High retail value. 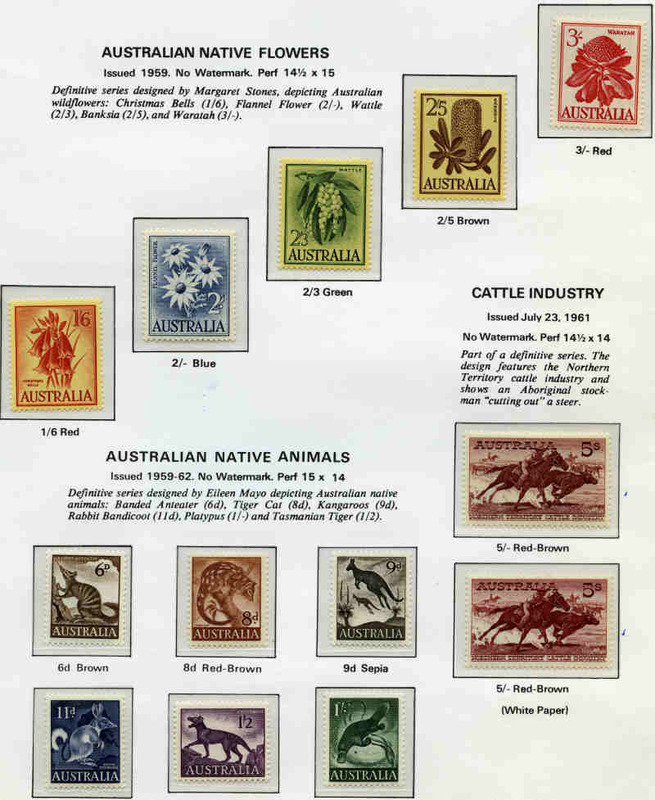 Collection of used Kangaroo's, KGV, Pre-Decimal and Decimal stamps from 1913 to 1981 on Seven Seas Standard pages. 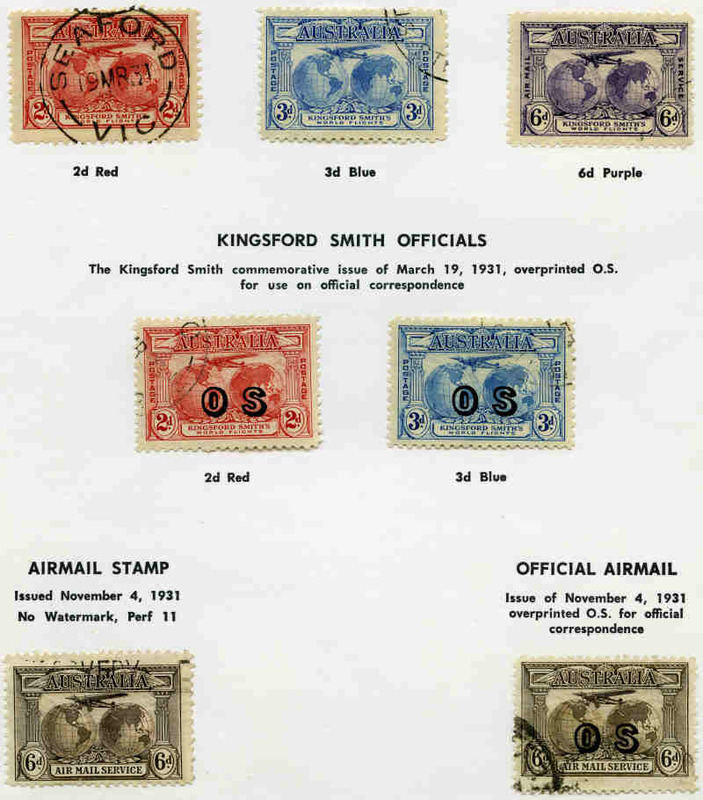 Includes near complete KGV issues excluding 1d Green Die II only, 1914 6d Claret Kooka, 1931 2d and 3d Kingsford Smith O/P OS CTO, 1932 1/- Lyrebird O/P OS, 1934 Perf 10½ and 11½ Vic Centenary sets, 1934 Macarthur set of 4, 1935 Anzac set, 1935 Silver Jubilee set, 1938-49 Thick and Thin Paper Robe sets and 1949-50 Arms set. Generally good to fine used condition with some minor faults. 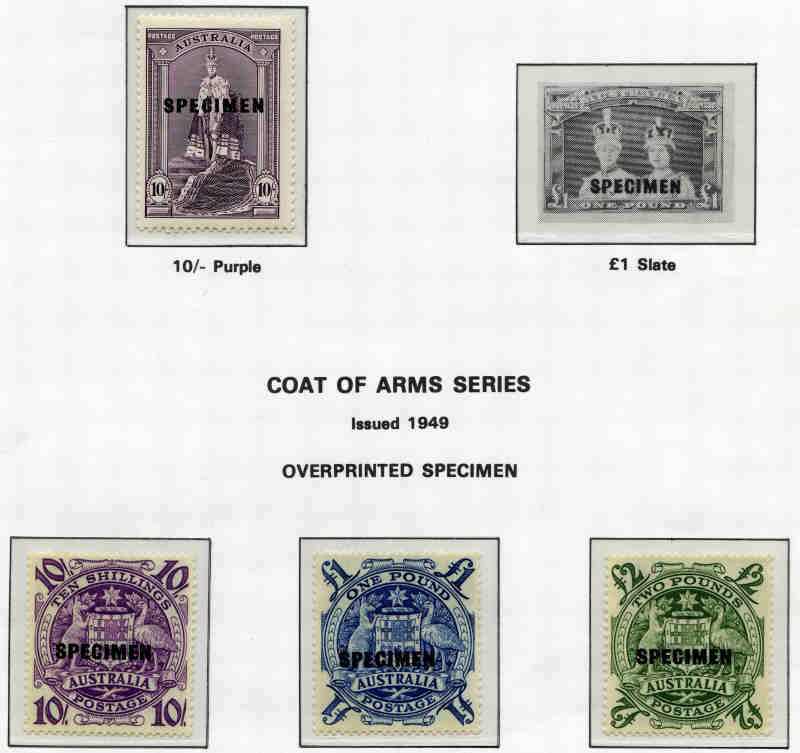 Collection of mint Pre-Decimal issues from 1927 to 1965 in Seven Seas Hingeless album with slipcase. 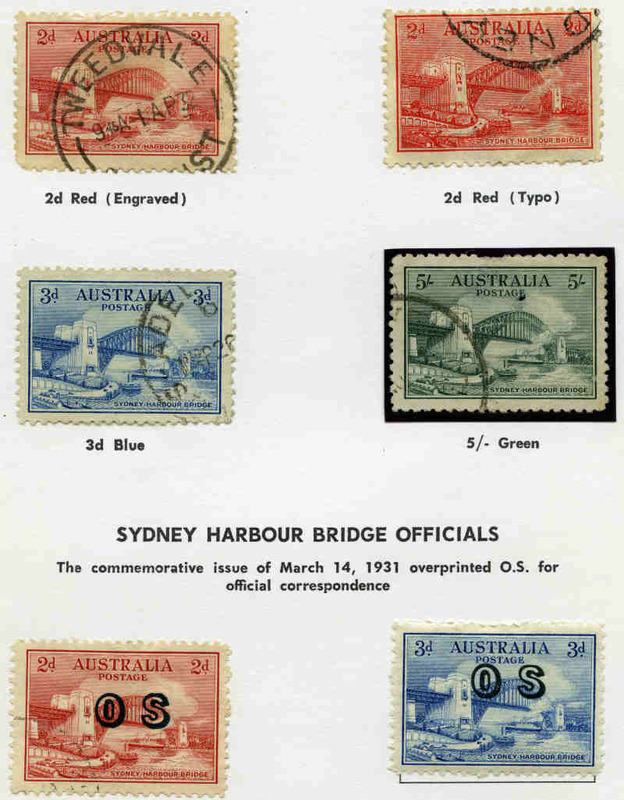 Includes 1928 3d Blue Kookaburra M/S, 1931 6d Brown Airmail, 1932 5/- Green Sydney Harbour Bridge CTO with small tone spot, 1934 Perf 10½ Vic Centenary set, 1934 Macarthur set of 4, 1935 Anzac set, 1935 Silver Jubilee set, 1936 SA Centenary set, 1937 NSW Sesqui set, 1937 3d Blue Die I White Wattles KGVI, 1938-49 Thick Paper Robe set, 1940 AIF set, 1949-50 Arms set O/P Specimen and 1961-64 5/- Cream and White Paper Cattle. Generally fine MLH or MUH condition with odd minor fault. High retail value. 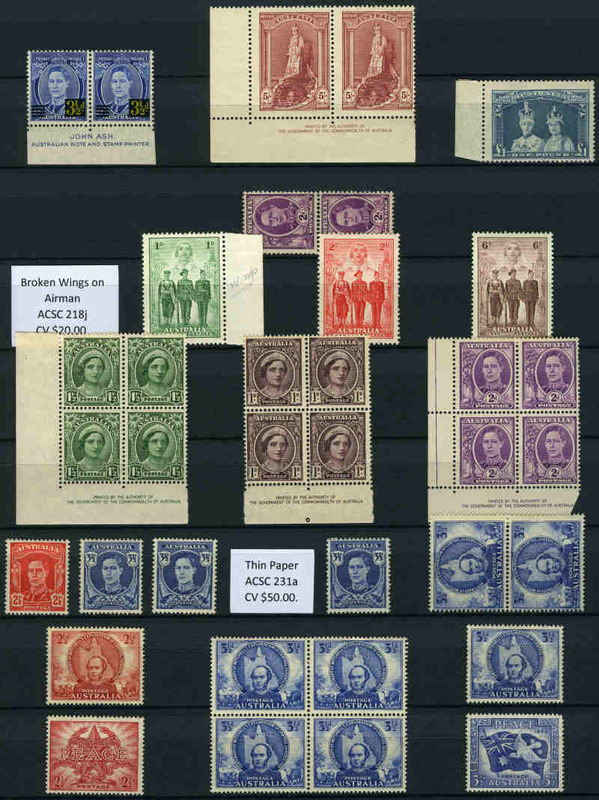 Collection of hundreds of used Pre-Decimal stamps from 1927 to 1965 including handy items and some duplication. 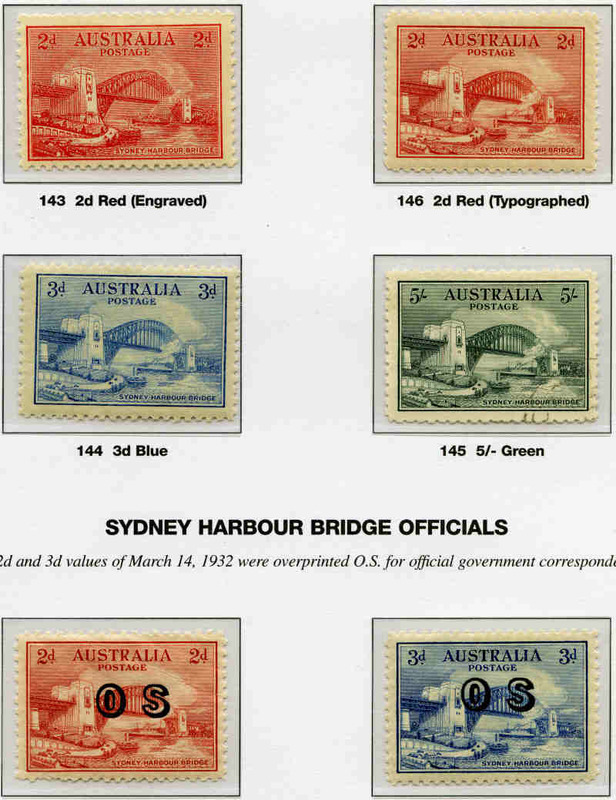 Noted 1928 3d Kooka perf OS, 1929 3d Airmail Type B perf OS, 1931 6d Airmail O/P OS, 1932 1/- Lyrebird O/P OS, 1932 5/- Sydney Harbour Bridge CTO and well centered with few shortish perfs, 1934 Perf 10½ Vic Centenary set, 1934 Macarthur set, 1935 Silver Jubilee set, 1935 Anzac set, 1937 2d NSW Sesqui with Man with tail variety, 1938 2d Scarlet Die II KGVI with "Medallion" flaw, 1938 Thick Paper Robe set, 1949-50 Arms set and 1964 5d Airmail with Re-entry to second "A" of "Australia" retouched variety. Also small range of Australian States, Australian Antarctic Territory and Cocos (Keeling) Is issues. Usual variable condition. 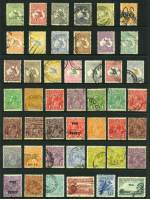 Collection of mint Pre-Decimal and Decimal stamps from 1927 to 1984 in Schaubek Hingeless album. 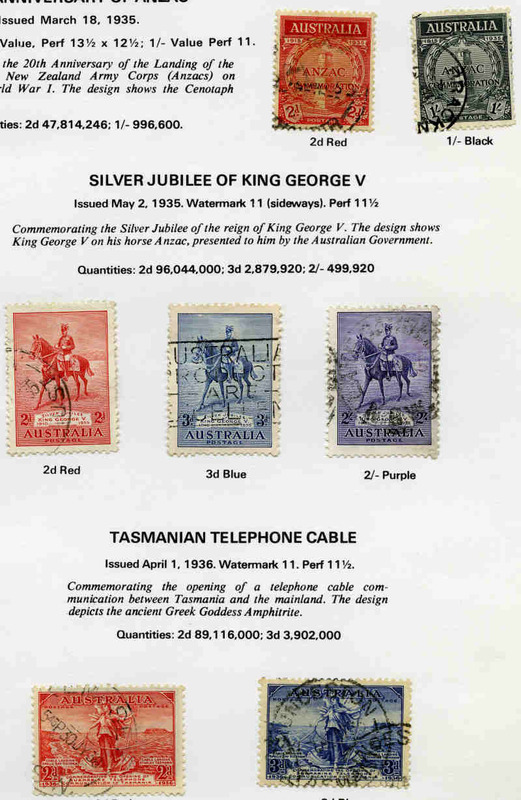 Includes a useful range of Kangaroo and KGV issues, 1928 3d Kookaburra M/S, 1934 Perf 10½ Vic Centenary set, 1934 Macarthur set, 1935 Silver Jubilee set, 1936 SA Centenary set, 1937 NSW Sesqui set, 1938 £1 Thick Paper Robe, 1964 £2 Navigator FU and complete MUH Decimal collection including 1971 White Paper Christmas unfolded block of 25. Odd minor fault and Pre-Decimal issues mixed MLH and MUH. 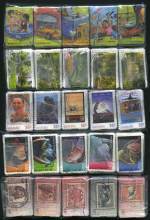 2008 55¢ Favourite Australian Films, 2009 55¢ Australia's Favourite Stamps and 2009 55¢ Australia Post - 200 Years, 2009 55¢ Australian Parks and Gardens Peel and Stick sets in bundles of 100 good to fine used. (1,000 sets of each). 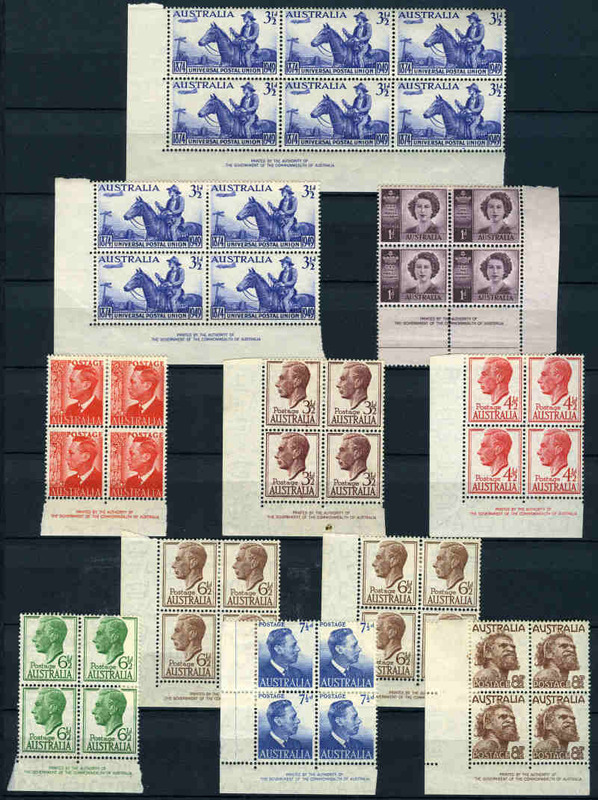 Accumulation of 1,978 mostly low value MUH Pre-Decimal stamps from 1938 to 1961 in blocks, half sheets and sheets including many duplicates and odd fault. Noted 1945 2/- Maroon Redrawn Die C of A Wmk Kangaroo well centered corner block of 10. 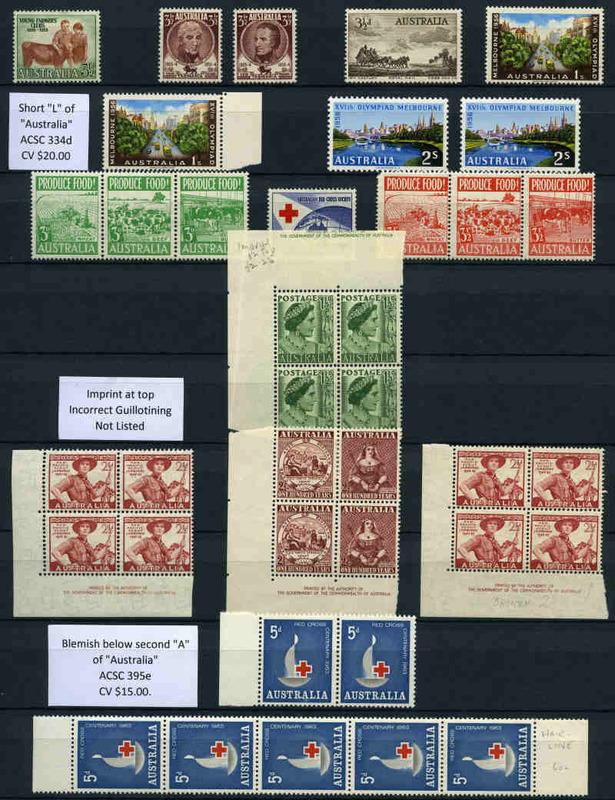 Accumulation of 8,000 MUH low value Pre-Decimal issues from 1942 to 1965 in singles, blocks, part sheets and sheets including range of better issues, numerous imprint blocks and some varieties with varying duplication. Accumulation of 106,500 Pre-Decimal and Decimal stamps from 1938 to 1979 in bundles of 100 including over 56,000 commemorative issues. Good variety. Accumulation of mostly MUH Pre-Decimal and Decimal issues in singles, blocks and half sheets in VST LB32 stockbook. Also Prinz Royal 30/60 and Lighthouse L4/8 stockbooks in very good condition. 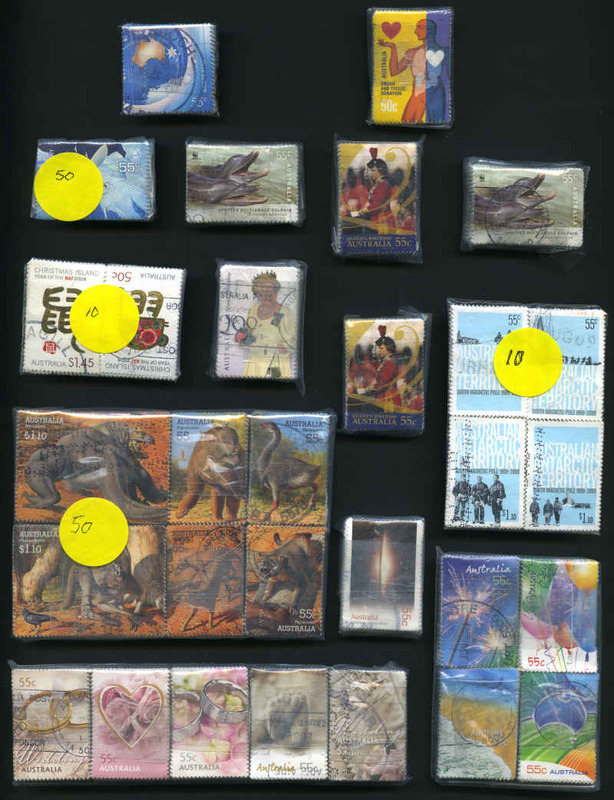 Accumulation of tens of thousands of mostly Decimal used stamps from 1966 to early 1990's in carton. 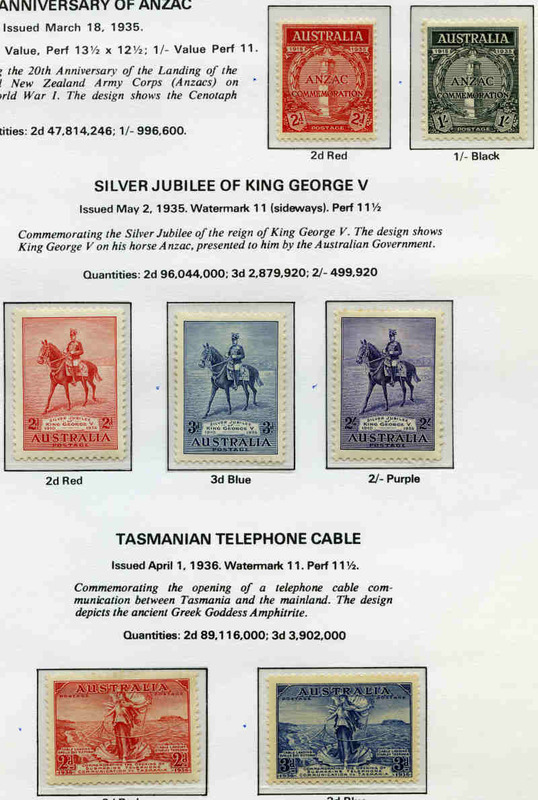 Includes some higher value commemorative and Pre-Decimal content. 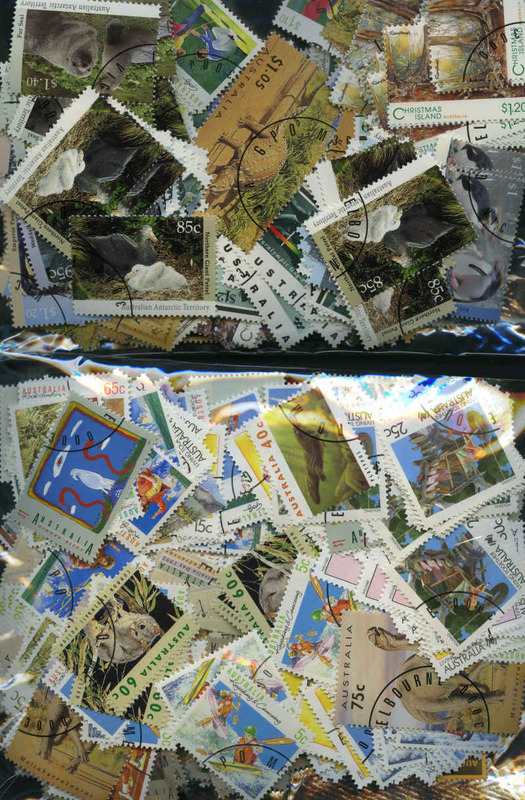 Also accumulation of thousands of used Foreign stamps in shoebox with main strength in New Zealand. 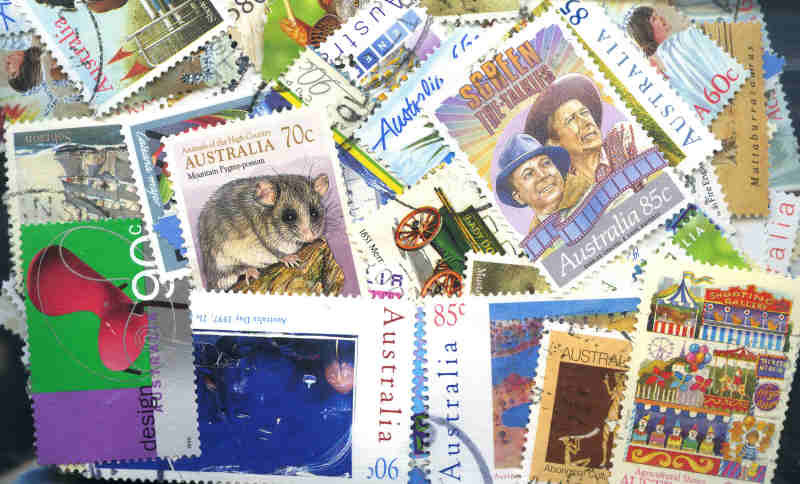 Accumulation of 45,700 mostly Decimal commemorative stamps in bundles of 100 including some Australian Antarctic Territory. Main strength in 1980's, but includes some Pre-Decimal and earlier Decimal content. 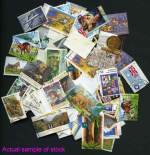 Some bundles contain a mixed range of stamps. Also 4,300 Definitive issues. 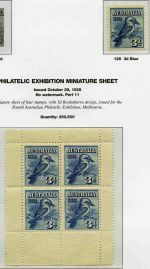 Accumulation of 72,000 commemorative and 14,400 definitive Decimal stamps in bundles of 100 including some Australian Antarctic Territory. Main strength in 1980's, but includes some Pre-Decimal and earlier Decimal content. 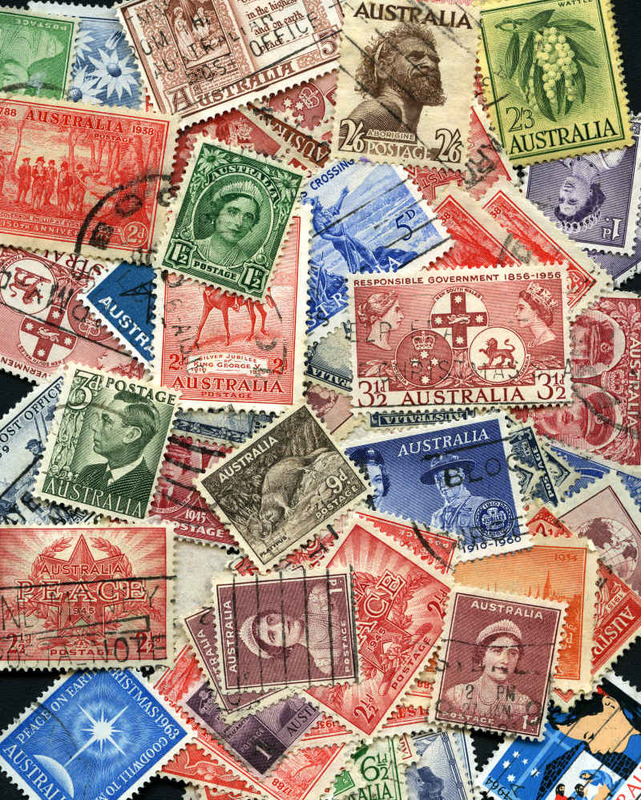 Some bundles contain a mixed range of stamps. 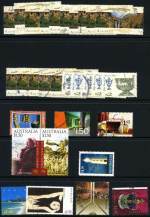 Accumulation of 5,610 good to fine used Decimal Commemorative sheet stamps from 2006 to 2009, all sorted into various size bundles including 2006 Dangerous Australians set (50), 2008 $1.10, $1.65 and $2.75 Tourist Precincts (150 of each), 2008 For Every Occasion set of 10 (50), 2008 Megafauna set (50), 2009 Queensland - 150 Years set (50), 2009 55¢ Australian Parks and Gardens set (50), 2009 55¢ Legends of the Screen set (50), 2009 Australian Songbirds set (50), 2009 55¢ Classic Toys set (50) and 2009 55¢ Australia Post - 200 Years set (50), plus few Territory issues. 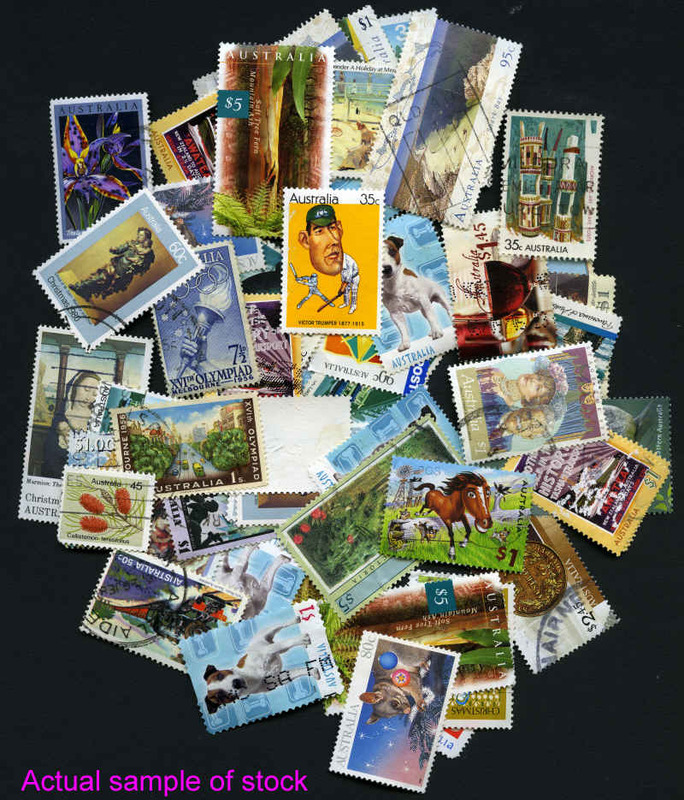 Accumulation of many thousands of used Pre-decimal stamps off paper in shoebox. 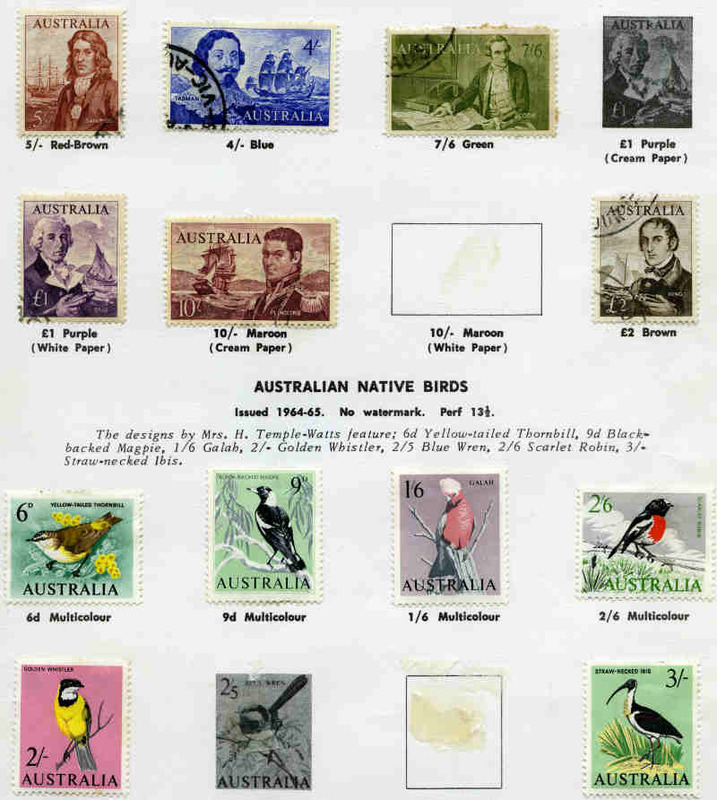 Accumulation of 45,500 Decimal commemorative stamps in mostly mixed bundles of 100 including some Australian Antarctic Territory. Main strength in 1980's. 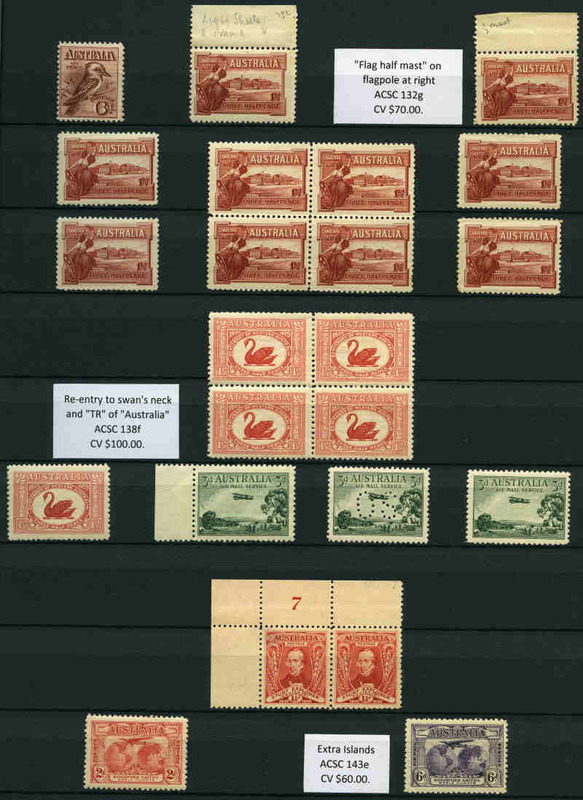 Accumulation of many hundreds of mostly MUH Pre-Decimal stamps with varying duplication on Hagner sheets. 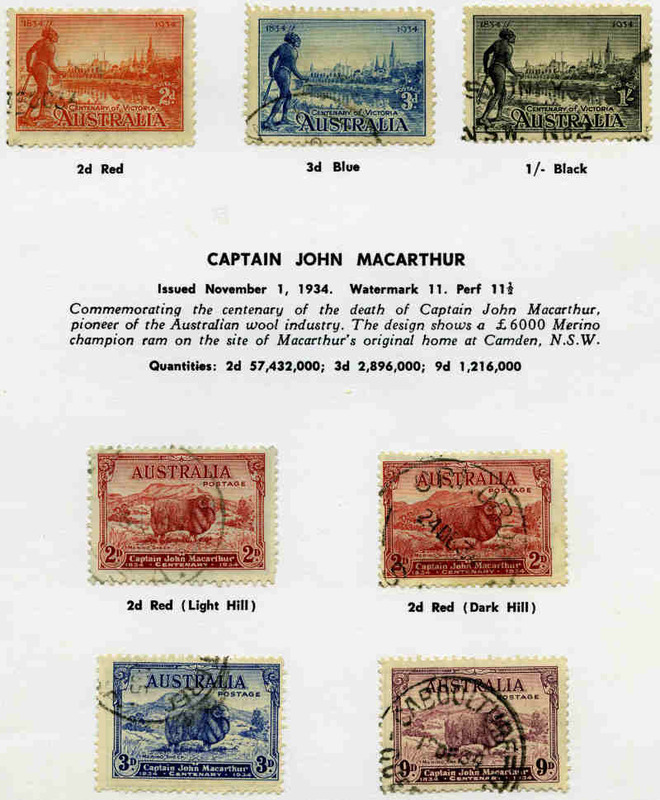 Noted 1927 1½d Canberra, 1928 3d Kooka, 1929 1½d WA Centenary and 1930 Sturt set perf OS, 1929 3d Airmail Type B block of 4 MLH/MUH, 1931 6d Brown Airmail O/P OS, 1932 1/- Lyrebird MLH, 1934 Macarthur set MLH, 1934 1/6 No Wmk Hermes MLH, 1935 Anzac set MLH, 1935 Silver Jubilee set, 1936 S.A. Centenary set, 1937 NSW Sesqui set MLH, plus 9d imprint block of 4, 1937-40 3d Blue Die I White Wattles, Die I, Die IA and Die II Thick Paper KGVI MLH, 1938 £1 Thick Paper Robe, 1940 AIF set, 1953 Food blocks of 9 set, 1963-64 Navigator set MLH and handy range of 2/- and 2/3 commemoratives. Odd fault and mixed centering. 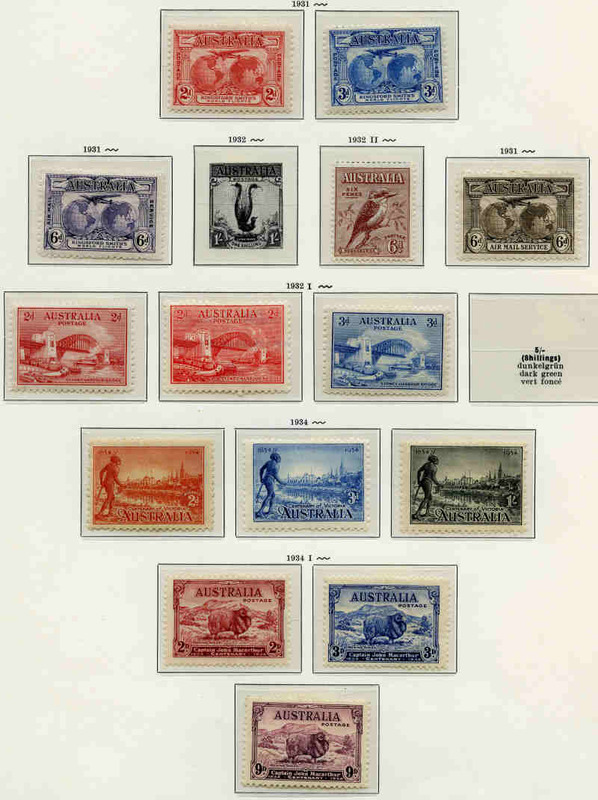 Accumulation of hundreds of mostly MUH Pre-Decimal stamps in singles and blocks, plus range of used Kangaroo and KGV issues and several covers in Hagner album. 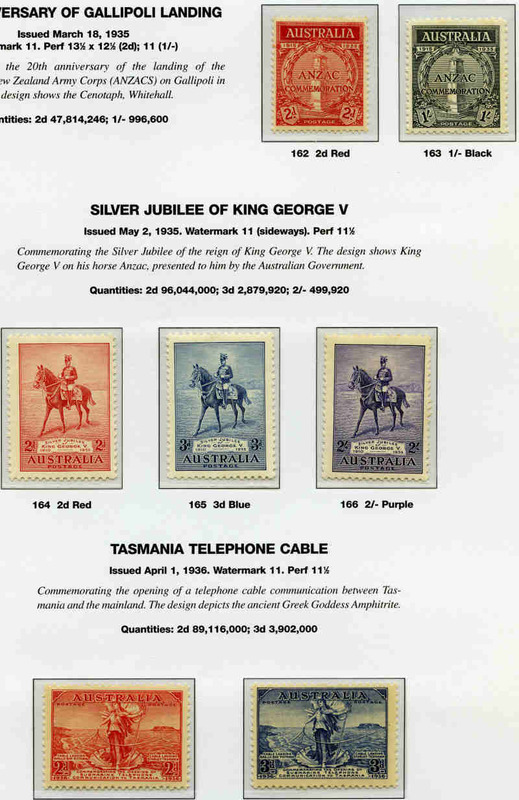 Includes 1913 1d Red Engraved KGV MUH (35), 1930 1½d Sturt Plate No's 1 to 8 set and 3d Plate No's 1 and 2 in MUH corner blocks of 4, 1932-35 C of A Wmk Kangaroo set O/P Specimen MLH, 1932 1/- Lyrebird imprint pair MLH, 1940 AIF set MUH, 1938 1/4 KGVI MUH (73) and 1953 Food set in MUH half sheets of 50. Some faults, but generally fine condition. 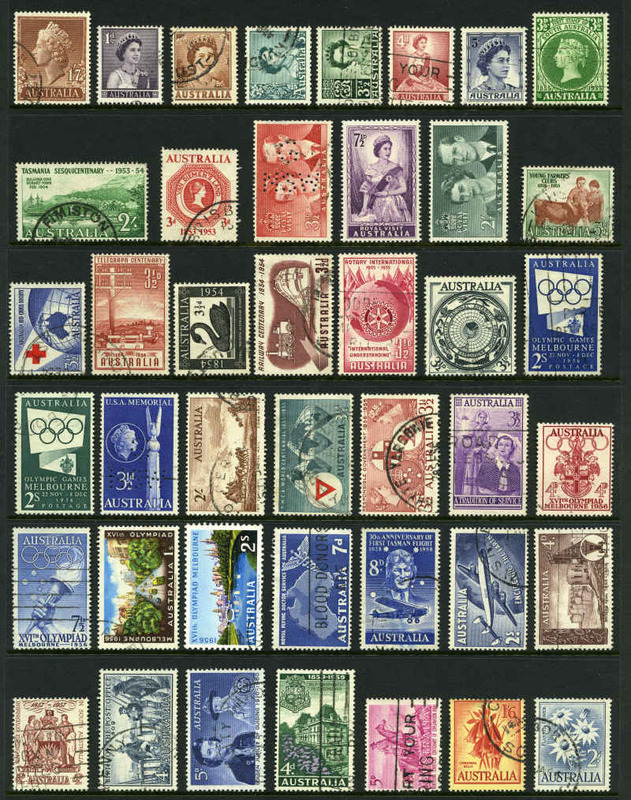 Collection of mint and used stamps from 1913 to 1978 on Seven Seas Leaves and on Hagner Sheets with some light duplication. Noted 1934 1/- Vic Centenary perf 10½ CTO and 11½ FU, 1935 2/- Silver Jubilee MLH and VFU, 1949-50 Arms set MLH and FU(2), 1963 £2 Navigator MUH, plus a FU copy with a few short perfs and many more. Odd fault. Collection of mostly MUH stamps from 1913 to 1973 including handy items and 1971 Christmas block of 7 and block of 25 in 3 volume Seven Seas album. 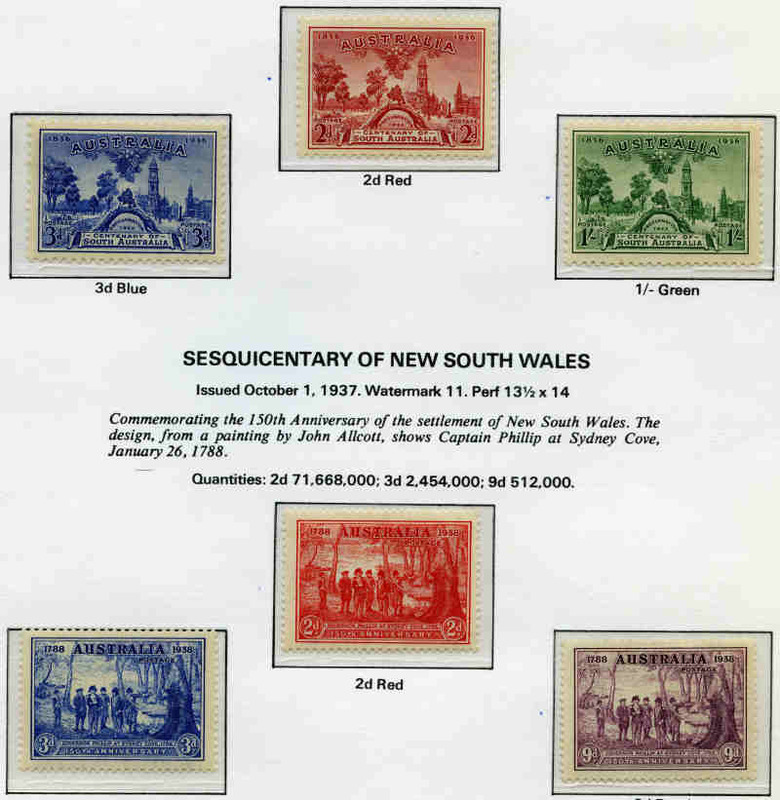 The Pre-Decimal leaves are Standard pages with Hingeless mounts added, the Decimal pages are Hingeless and complete to 1994 with numerous optional pages, the odd page with fault. 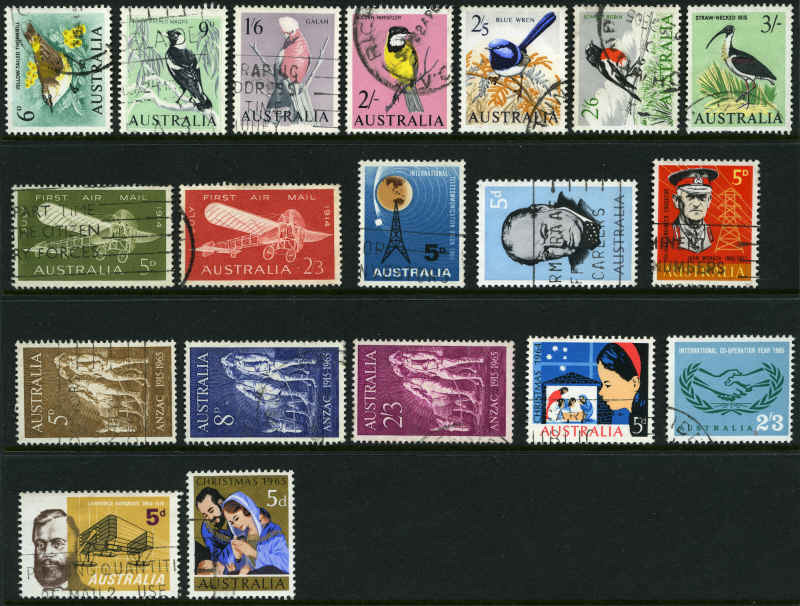 Also collection of Australian Territories and Papua and New Guinea mint and used stamps on Seven Seas standard leaves. 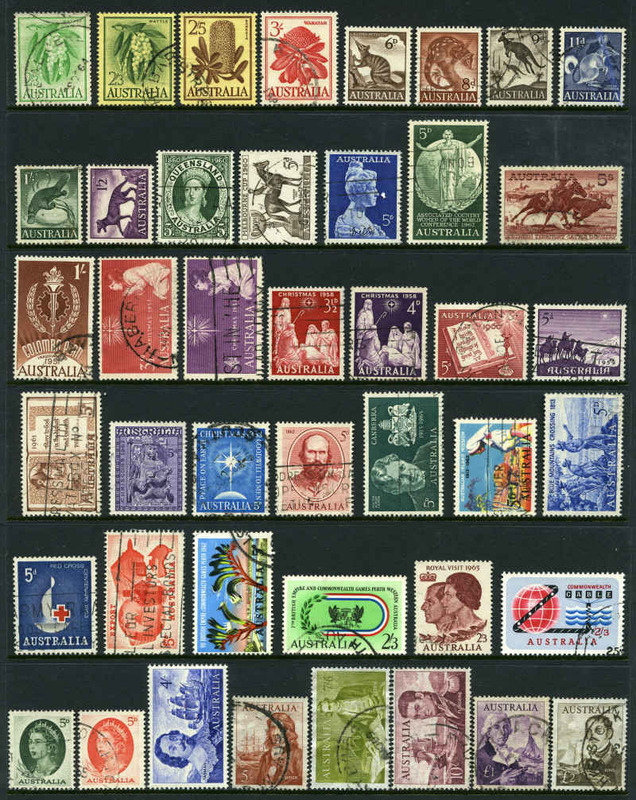 Collection of mostly used Decimal stamps from 1966 to 1995 including 1971 Christmas block of 7 and block of 25 MUH, many higher value commemorative issues and numerous sets in Seven Seas Hingeless album in 2 binders. Mainly good to fine used with some later issues CTO with gum. 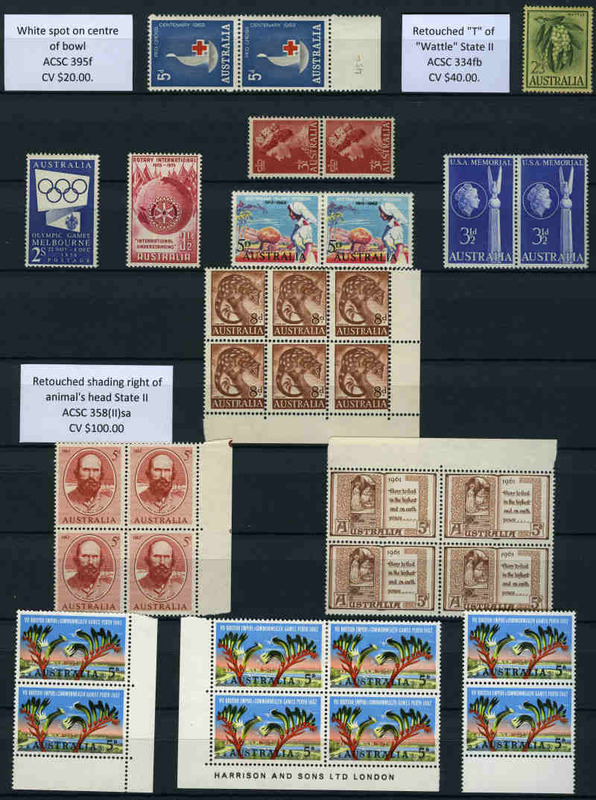 Collection of used stamps with main strength in Decimal issues, some later issues being CTO with gum in Seven Seas Standard album. Also a small selection of MUH stamps and miscellaneous items. 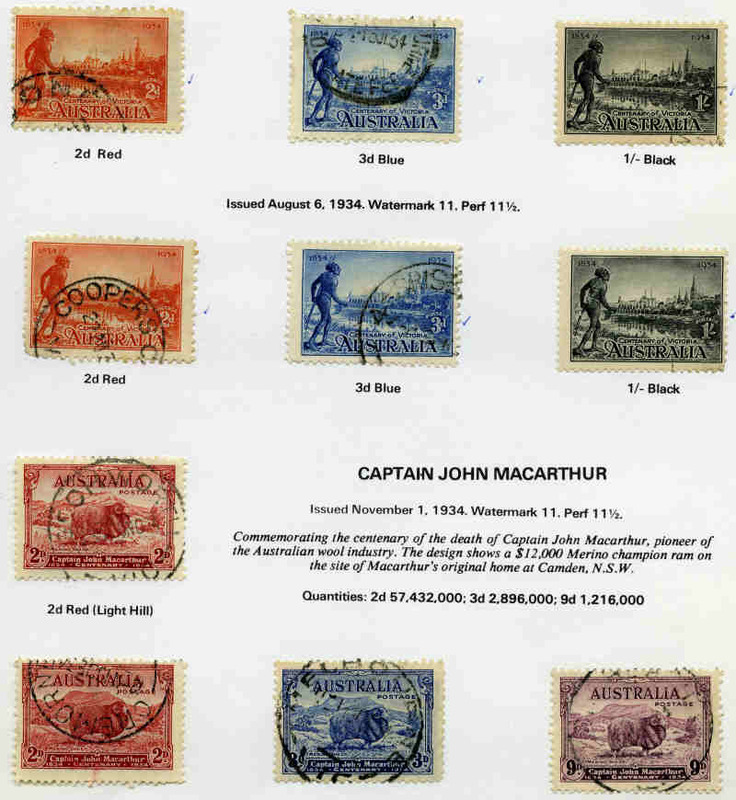 Selection of Pre-Decimal MLH and MUH stamps in Lighthouse stockbook with a few handy items and some blocks of 4. 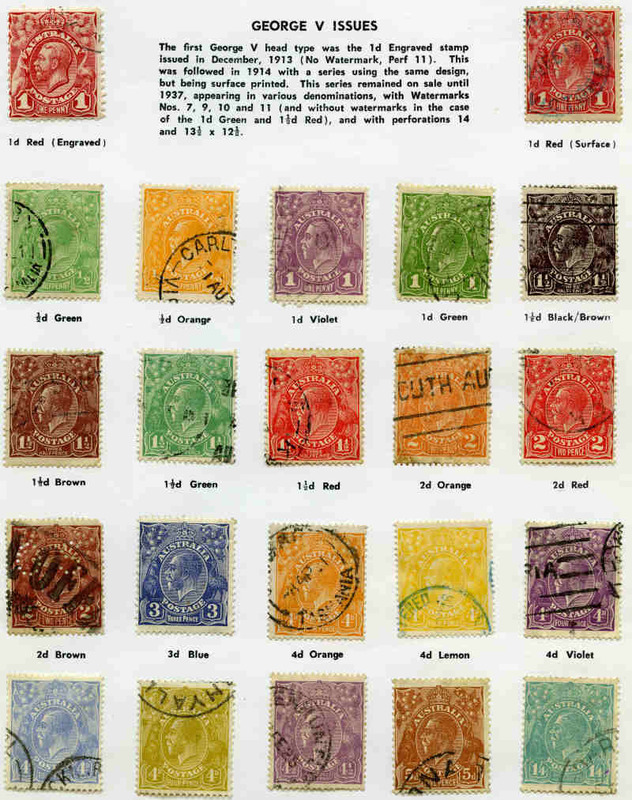 Also large number of modern Postal Stationery items, mint and used PSE's, Special postmarks, Stamp cards, Maximum cards, "Our World" books, Lighthouse stockbooks containing MUH British stamps and mostly used USA and Canadian stamps and more. 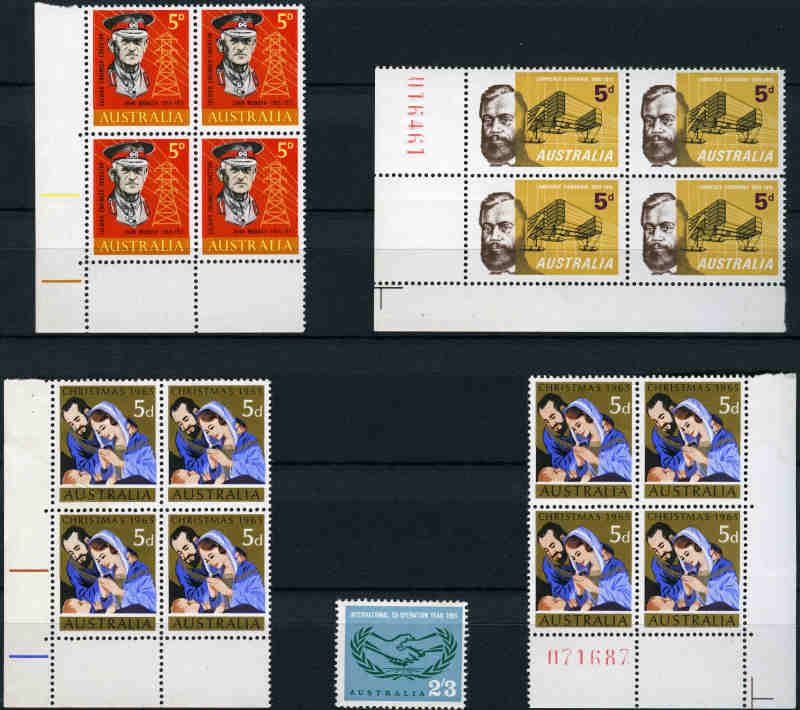 Collection of good to fine used Decimal stamps from 1966 to 2009 including 1971 Christmas block of 7, many higher value commemorative issues, several miniature sheets and numerous sets in Lighthouse stockbook. Also VST 2007 Volume 1 and 2 Australian catalogue new. 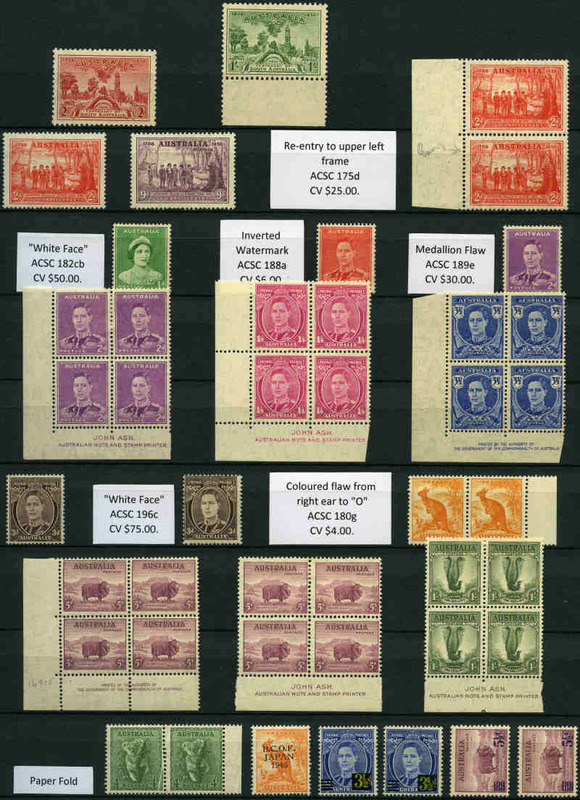 Accumulation of 6,300 MUH low value Pre-Decimal issues from 1927 to 1965 in singles, blocks, part sheets and sheets including range of better issues, numerous imprint blocks and some varieties with varying duplication. 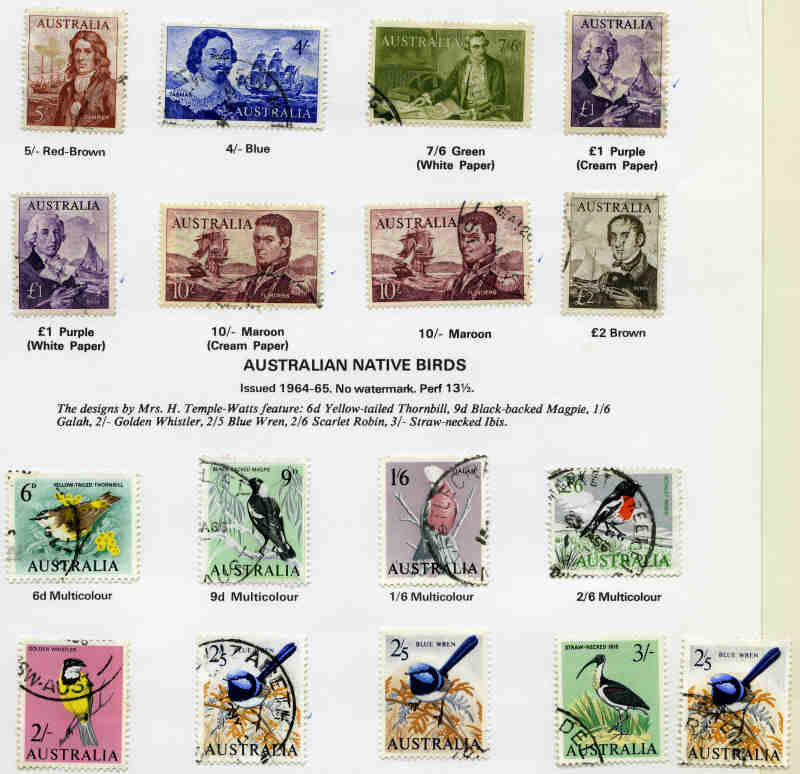 Collection of many hundreds of good to fine used Decimal stamps from 1992 to 2006 including some Australian Antarctic Territory and Christmas Is and Cocos (Keeling) Is Australia issues in 2 loose leaf albums. 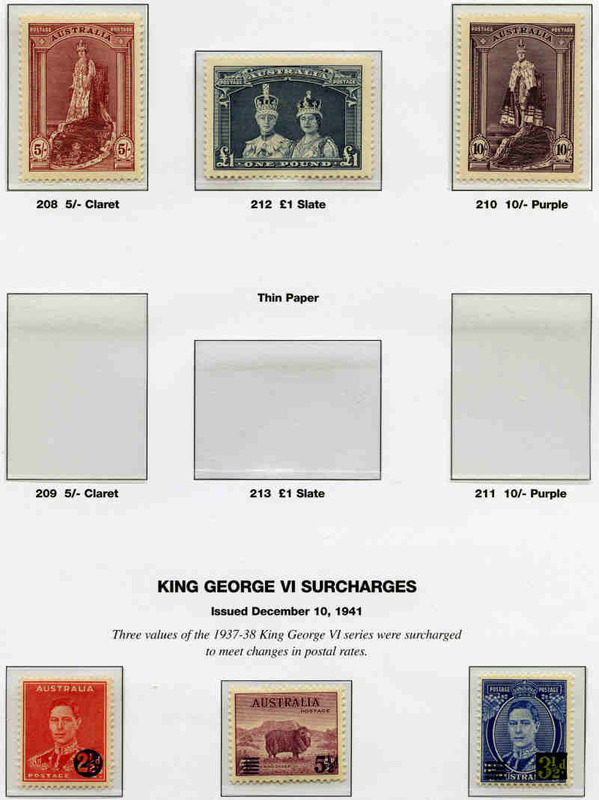 Includes many higher value commemorative issues, sets and miniature sheets. 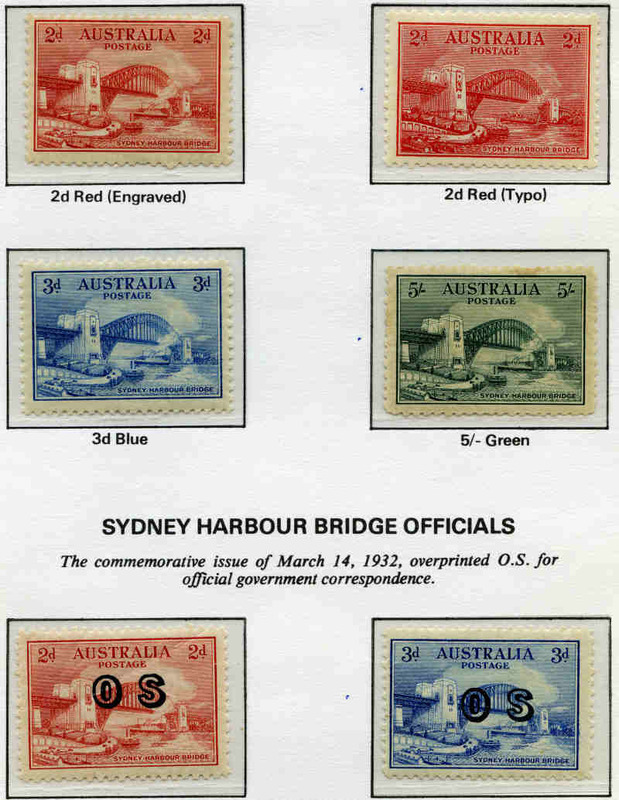 2003 50¢ Murray River Shipping (100), 2003 50¢ Bugs and Butterflies (100), 2004 50¢ Landmark Bridges (100), 2004 50¢ Australian Innovations (100), 2006 50¢ Postie Kate (100), 2006 50¢ Dangerous Australians (100), 2006 50¢ 50 Years of Television (100), 2007 50¢ Market Feast (100), 2007 50¢ Blast Off! 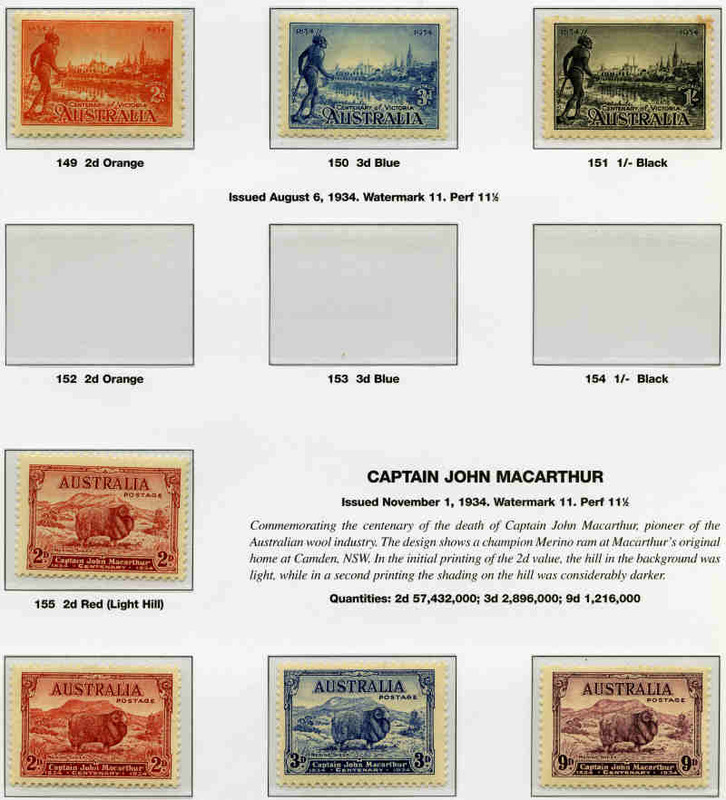 50 Years in Space (100), 2008 50¢ Australian Legends of Philanthropy (200), 2008 50¢ Heavy Haulers (100), 2008 50¢ Lest We Forget - Anzac Day (100), 2008 50¢ Working Dogs (200), 2008 50¢ Living Green (100), 2008 55¢ Megafauna (300), 2008 55¢ Favourite Australian Films (400), 2009 55¢ Legends of the Screen (100), 2009 55¢ Australia Post - 200 Years (300), 2009 55¢ Not Just Desserts (300), 2009 55¢ Australia's Favourite Stamps (700), 2009 55¢ Australian Parks and Gardens (600), 2009 55¢ Micro Monsters (200), 2009 55¢ Species at Risk (300), 2009 55¢ Corrugated Landscapes (300), 2009 55¢ Classic Toys (300) and 2009 55¢ Let's Get Active (200) Peel and Stick sets in bundles of 100 good to fine used. 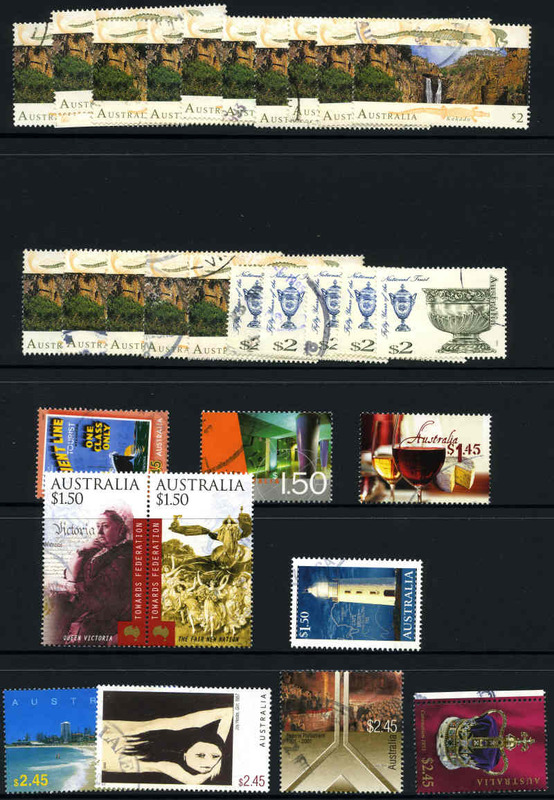 2009 55¢ Legends of the Screen (100), 2009 55¢ Australia Post - 200 Years (400), 2009 55¢ Not Just Desserts (500), 2009 55¢ Australia's Favourite Stamps (400), 2009 55¢ Australian Parks and Gardens (1,300), 2009 55¢ Species at Risk (300), 2009 55¢ Classic Toys (300), 2009 55¢ Let's Get Active (200), 2010 55¢ Kokoda (300) and 2010 55¢ Great Australian Railway Journeys (200) Peel and Stick sets in bundles of 100 good to fine used. Accumulation of many thousands of used Decimal stamps off paper in shoebox. 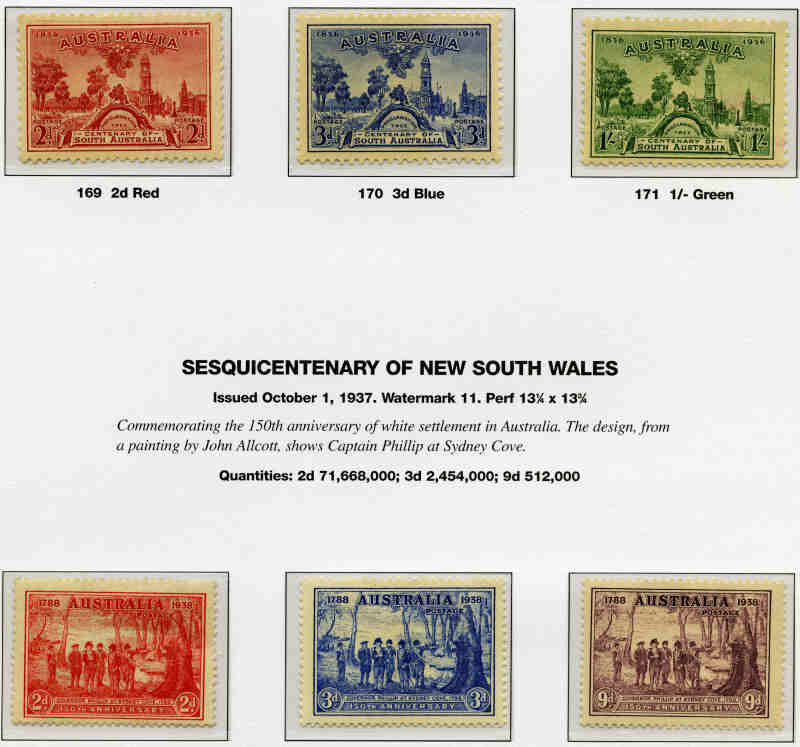 Accumulation of used Pre-Decimal and Decimal stamps from early to modern including range of Australian States and KGV issues in 5 stockbooks. Varying duplication. 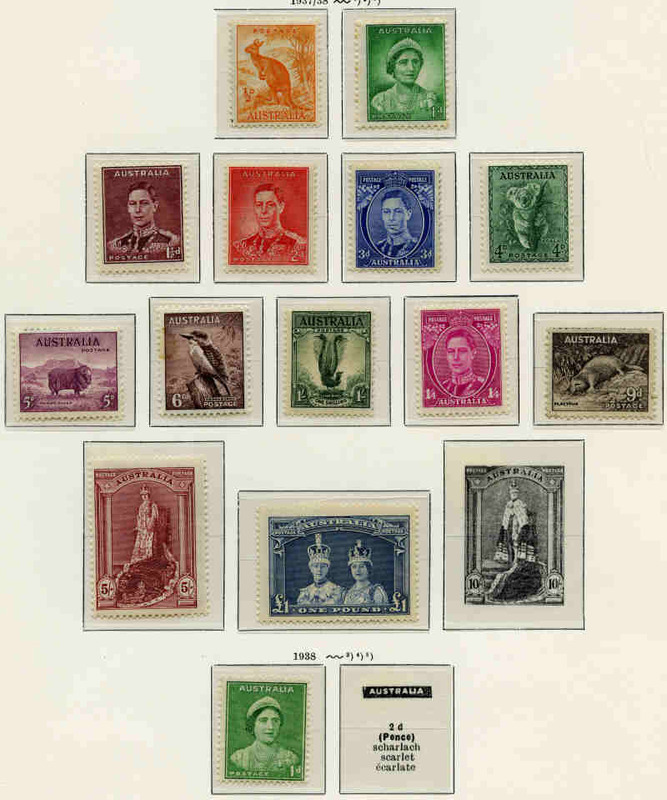 Accumulation of stamps in 3 albums with numerous handy items. 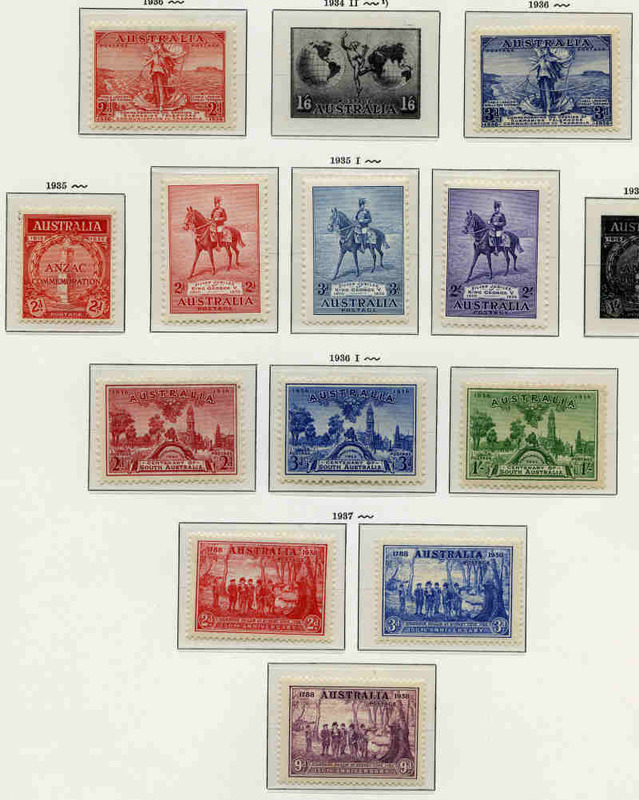 Main strength in mostly used Kangaroo and KGV issues with varying duplication and a handy selection of varieties. 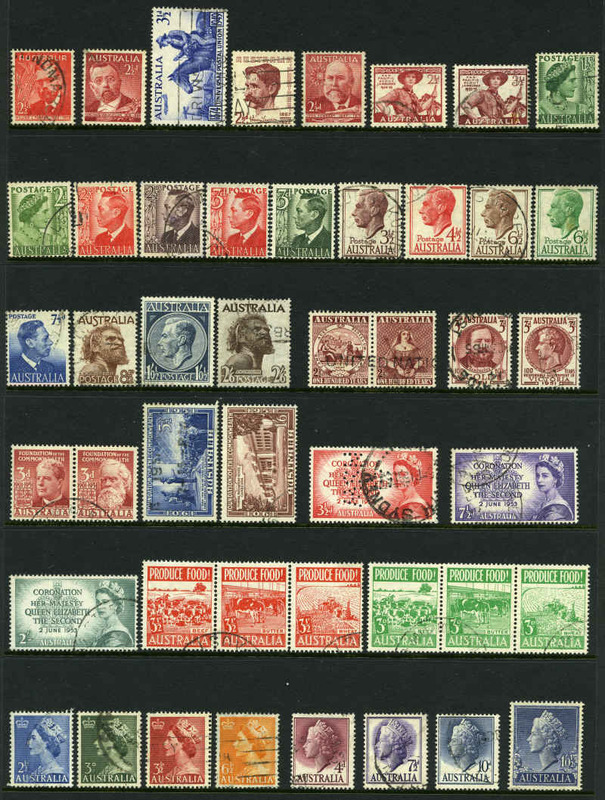 Collection of used stamps from 1913 to 1988 in Seven Seas Standard album pages and on leaves. 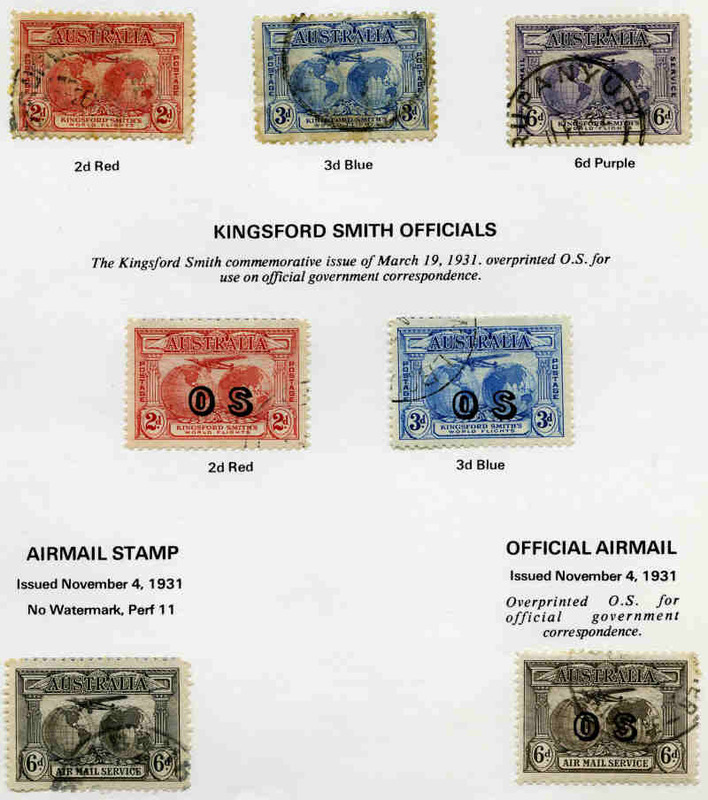 Noted a 1915 2/- Brown 2nd Wmk and 1932 10/- Grey and Pink C of A Wmk Kangaroos, 1931 3d Blue Kingsford Smith O/P OS CTO, 1938 Robes Thick paper set, 1949-50 Arms set, 1971 Chistmas block of 7 and block of 25 and a useful selection of other Pre-Decimal and Decimal items. 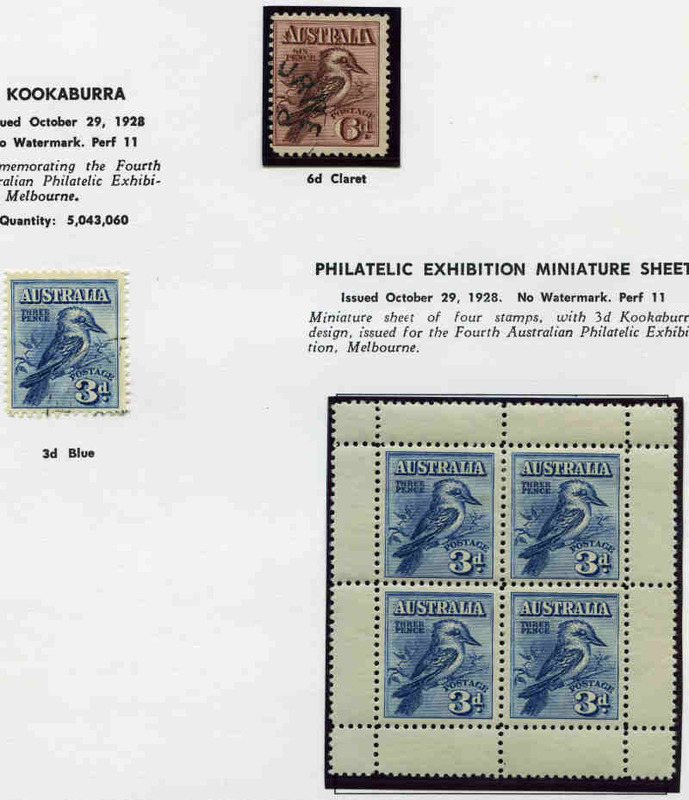 Accumulation of thousands of mostly used Pre-Decimal and Decimal stamps from 1927 to 1980's in 15 albums or stockbooks including range of Australian States, Kangaroo's and KGV issues, handy items and numerous duplicates. 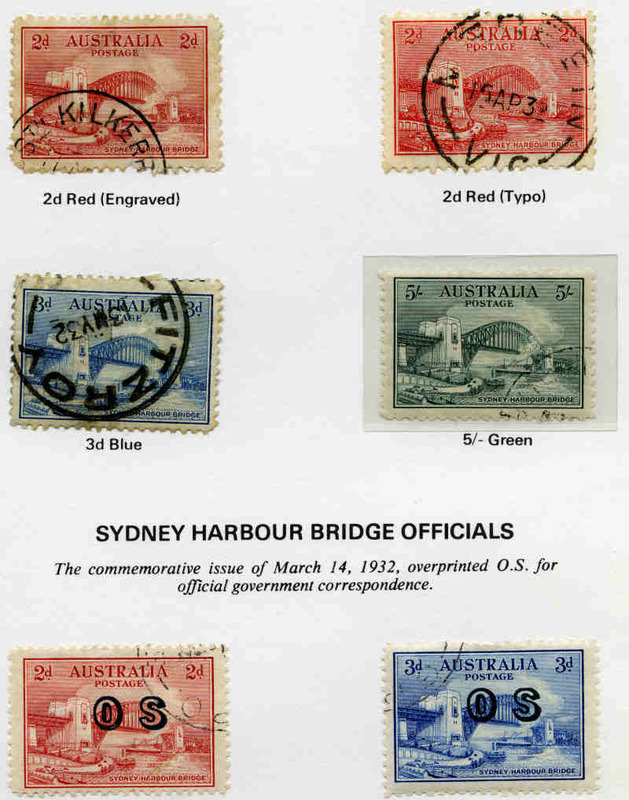 Collection of mint and used Pre-Decimal and Decimal stamps from 1914 to 1983 in 8 Seven Seas Hingeless, Standard and Junior albums including range of used Kangaroo and KGV, many handy items and numerous duplicates, plus accumulation of thousands of mint Pre-Decimal low values stamps in Lighthouse stockbook. Variable condition. 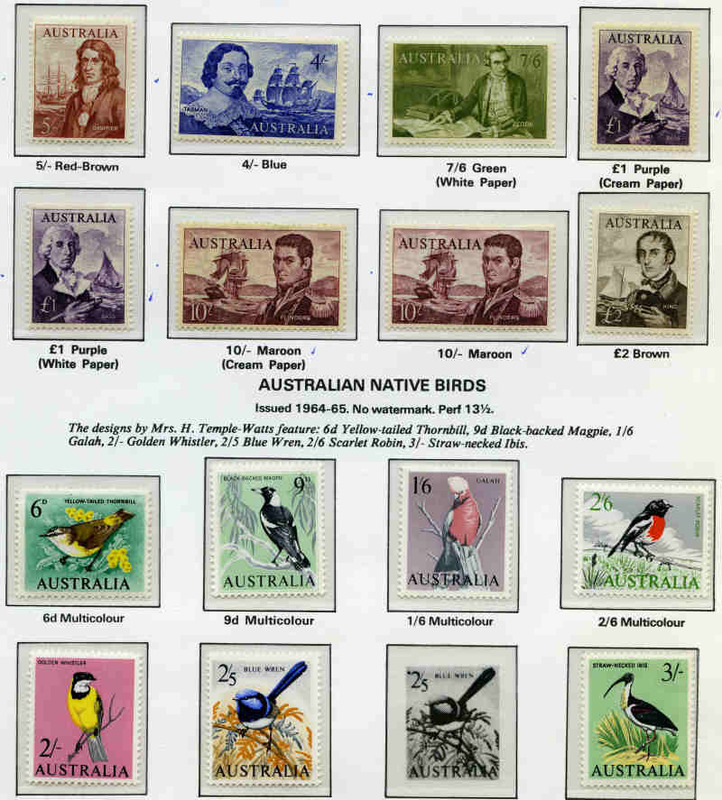 Accumulation of thousands of used Decimal stamps from 1966 to 1980 including numerous handy early issues and sets, plus range of modern letter rate issues from 1990's to 2008 in 9 Hagner albums and 2 Lighthouse stockbooks. Noted 1966 $4.00 Navigator (38), 1967 25¢ Christmas (27), 1968 20¢ Weather Watch (23), 1968 25¢ Intelsat (23), 1968 Soil and Medical gutter pair (4), 1968 25¢ Mexico Games (22), 1969 Primary Ind set (18), 1969 25¢ Christmas (17), 1972 Primary Ind set (29), 1972 35¢ Munich Games (40), 1972 35¢ Christmas (34), 1973 National Dev set (20) and 1973 30¢ Christmas (27). Varying duplication. 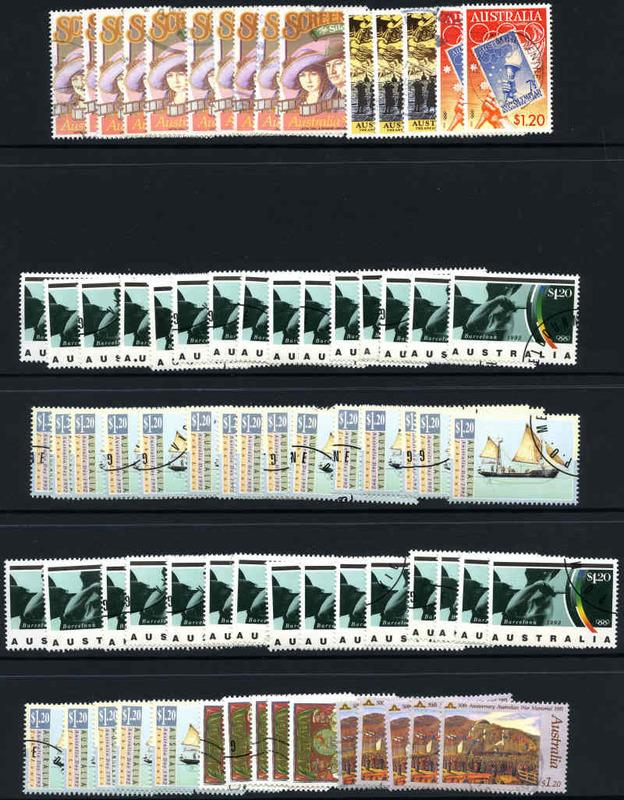 Accumulation of used Decimal stamps comprised of 55,300 commemorative and 34,100 definitive stamps from 1968 to 2008 in bundles of 50, combined into packets of various totals of 300 or more. Some heavy duplication. 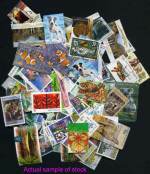 Accumulation of 400 used higher value $1.00 to $2.45 commemorative stamps from 1980's to 2000's. Good range with some duplication. Mainly fine condition. 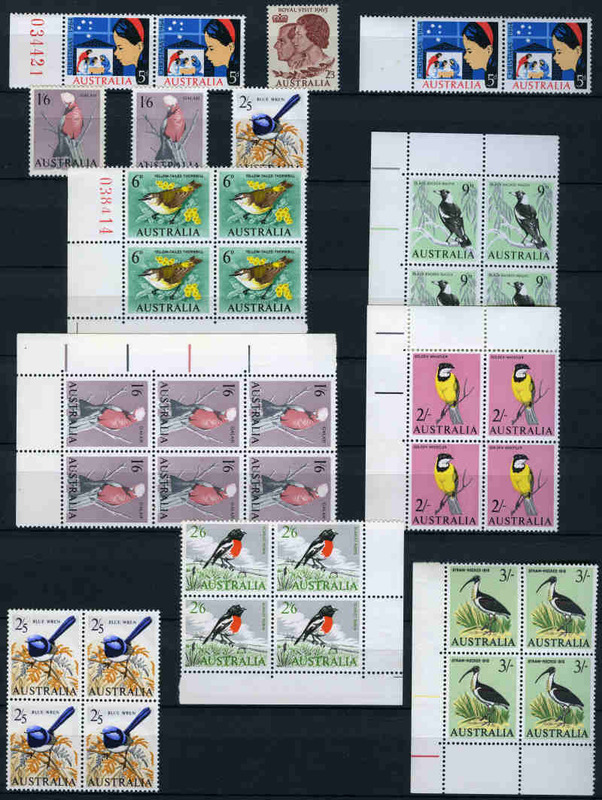 Accumulation of used Decimal stamps including few covers and some Foreign in 8 albums, plus 1985 Audubon's Birds of the World collection of 57 Fleetwood FDC's in special album. Also Deluxe Hagner binder with slipcase containing 66 Hagner sheets. 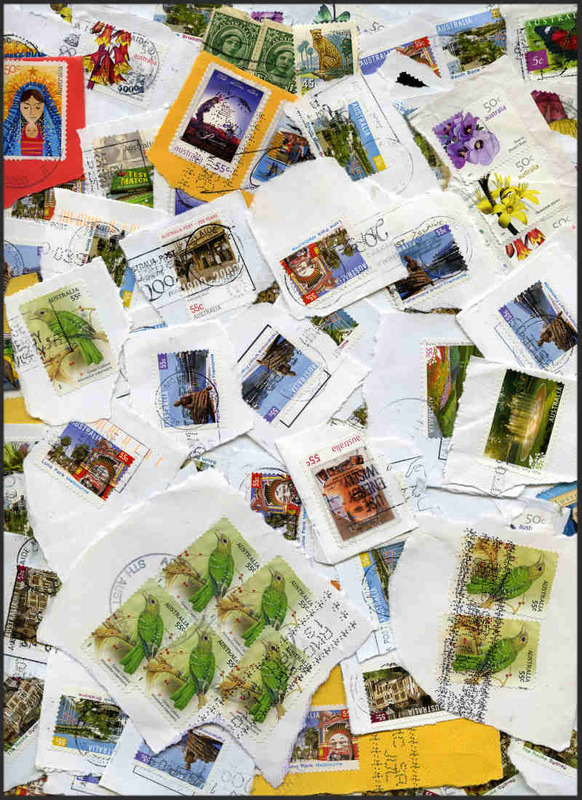 Accumulation of many thousands of mostly Decimal used stamps off paper in shoebox, Seven Seas and loose leaf album, bundle of commercial covers and small carton of on paper mixture including some Foreign content. Accumulation of mainly KGVI Pre-Decimal on paper mixture in small carton. Mostly Definitive issues. Useful for postmarks. 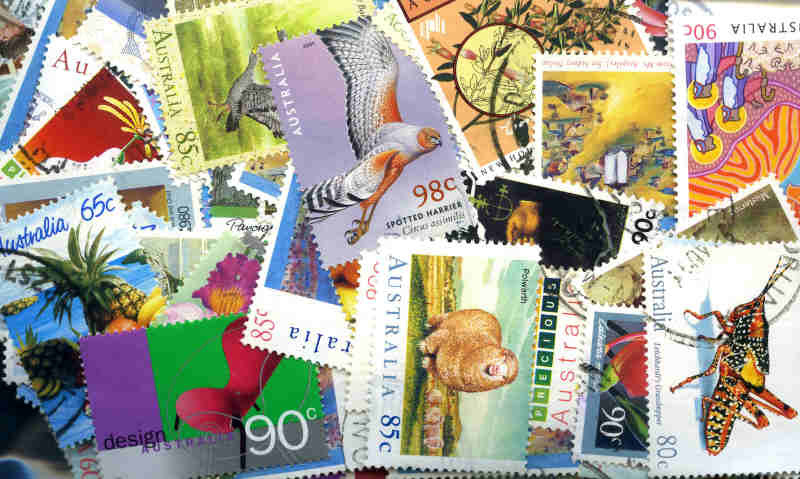 Accumulation of many thousands of modern used letter rate stamps off paper in shoebox. Accumulation of many thousands of Pre-Decimal and Decimal stamps sorted into packets in 5 shoeboxes including some KGV issues. 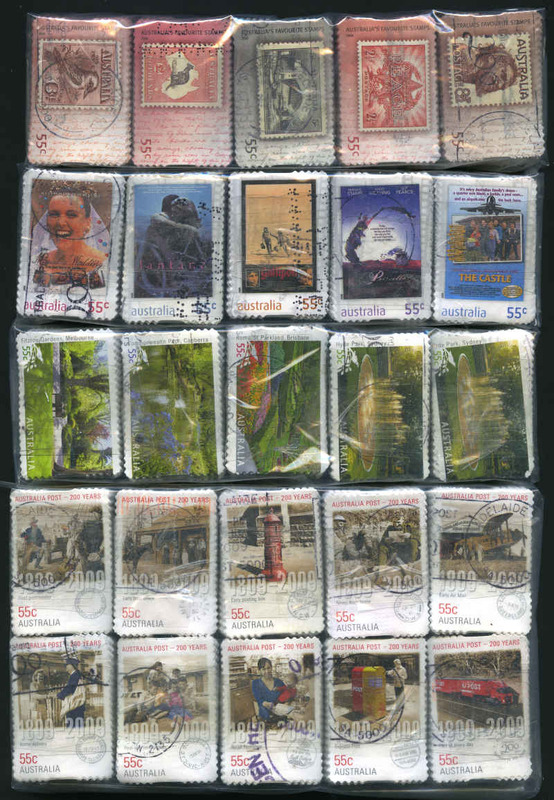 Also some stamps on piece with postmarks. Accumulation of many thousands of used Pre-Decimal and Decimal stamps from 1930's to modern, mainly sorted into envelopes and packets, plus on paper mixture including some Foreign in 4 shoebox. 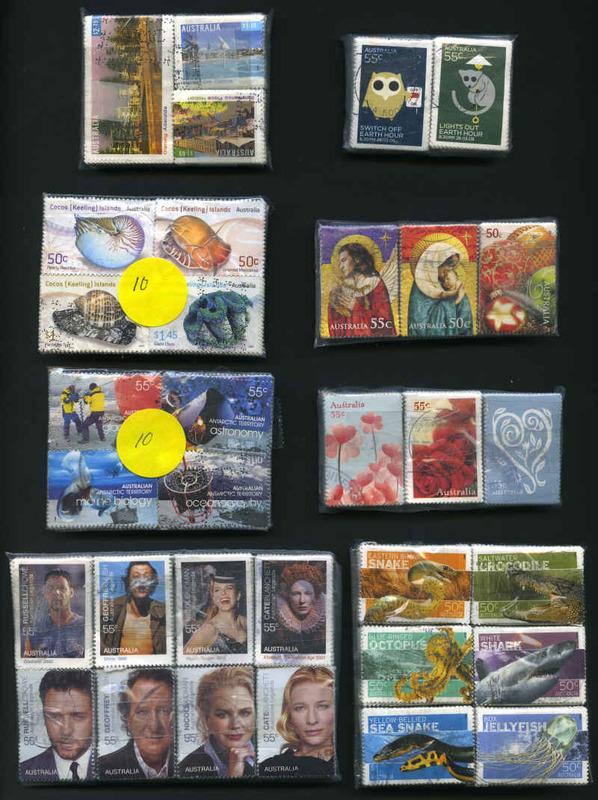 Also Foreign off paper mixture sorted into packets and small bundle of First Day and commercial covers in shoebox. Accumulation of 3kg of mostly KGVI and QEII period Pre-Decimal on paper mixture including some earlier content, plus 1970's and 1980's Decimal mixture in small box. Mostly Definitive issues, but includes a proportion of Commemoratives. Useful for postmarks. 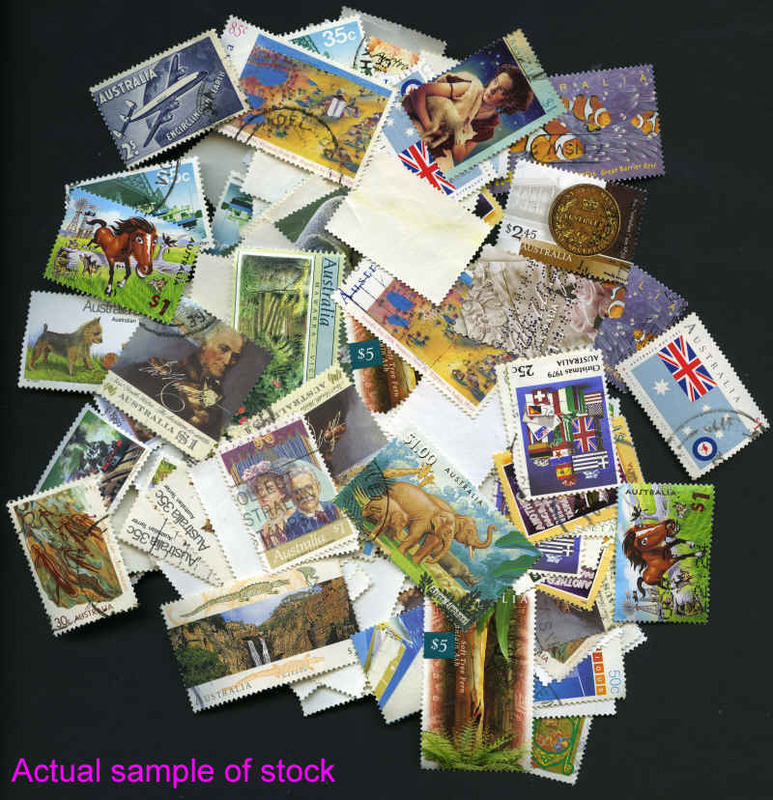 Accumulation of tens of thousands of used Pre-Decimal and Decimal stamps from 1927 to 1993 including numerous commemoratives, sets and better issues sorted into envelopes in 15 shoeboxes. Ideal for packet maker. 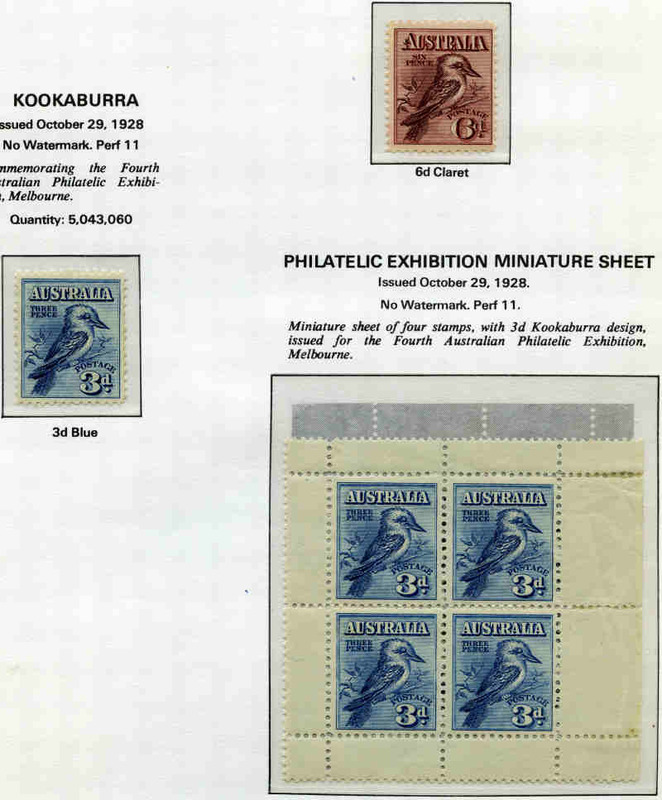 Accumulation of many thousands of used Pre-Decimal stamps on paper sorted into packets including some Kangaroo and KGV content, plus South Australian off paper accumulation in small box. 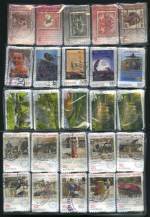 Also Australia and Foreign on paper mixture and range of used stamps in 3 albums and small box. Accumulation of tens of thousands of used Decimal stamps from 1970 to 1996 sorted into envelopes in 11 shoeboxes. 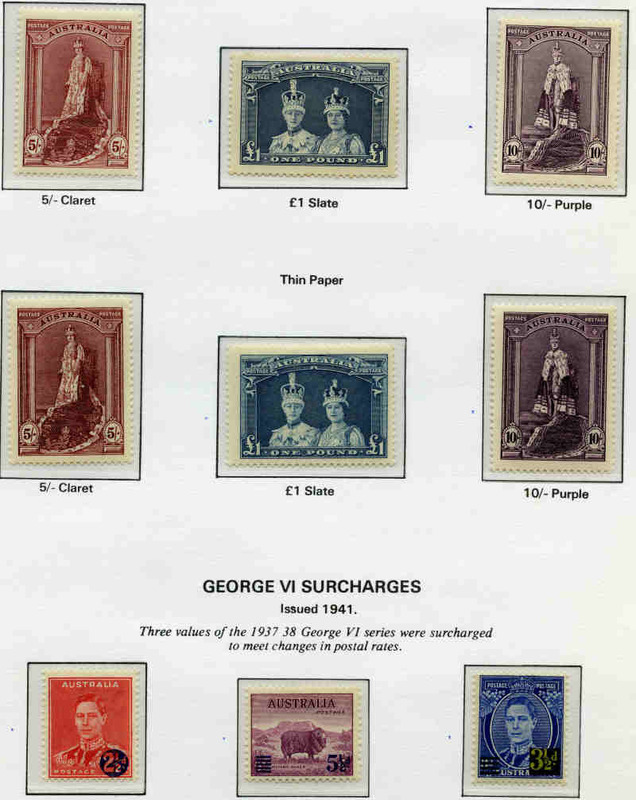 Numerous Commemorative issues. 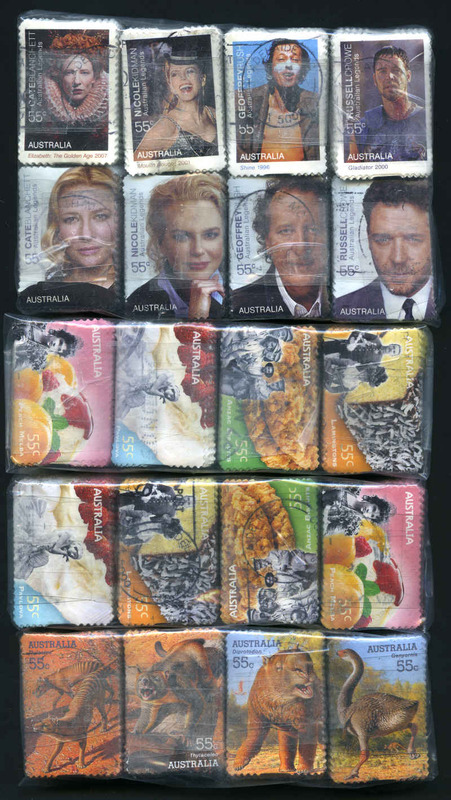 2008 55¢ Megafauna, 2008 55¢ Favourite Australian Films, 2009 55¢ Legends of the Screen, 2009 55¢ Inventive Australia, 2009 55¢ Not Just Desserts, 2009 55¢ Australia's Favourite Stamps, 2009 55¢ Australian Parks and Gardens and 2009 55¢ Micro Monsters Peel and Stick sets in bundles of 100 good to fine used. (500 sets of each). 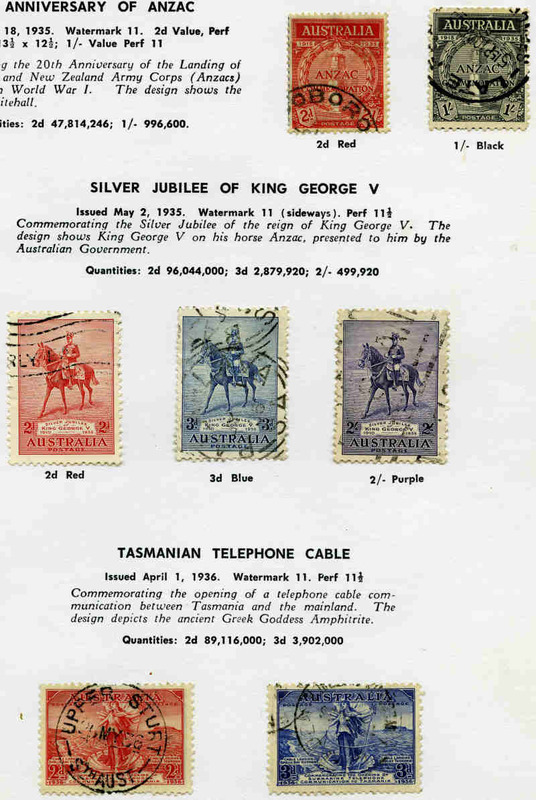 Accumulation of many thousands of used Pre-Decimal and Decimal stamps from 1927 to 1993 including numerous Decimal sets and higher value commemoratives, plus handy range of Australian States, Kangaroo's and KGV issues in 38 stockbooks. Varying duplication. 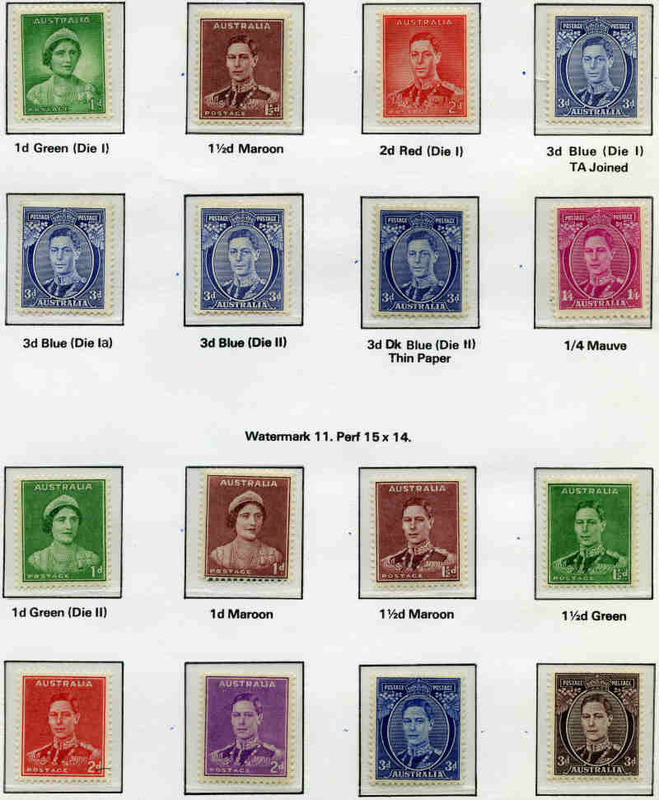 Selection of 120 MUH or MLH Pre-Decimal stamps mostly in imprint or Plate No blocks of 4, with some handy items. Also 1928 Kookaburra M/S MLH, but creased in selvedge. 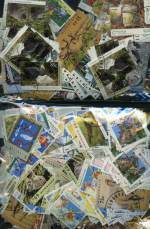 Large carton containing many thousands of mostly Decimal used stamps sorted packets with some modest higher value content. Accumulation of 14kg of on paper mixture containing mostly 2008 55¢ Tourist Precincts on close cut single paper. Accumulation of tens of thousands of used Decimal stamps off paper from early to modern in carton. Weight 10.5kg. Accumulation of 12kg of mainly modern close cut on paper mixture on single paper. Also packet of Decimal off paper mixture. Accumulation of 19kg of mainly recent close cut on paper mixture on single paper. 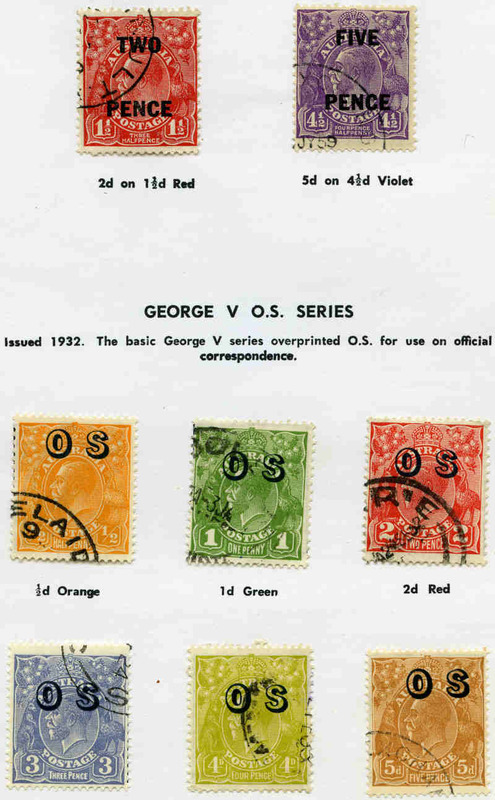 Accumulation of tens of thousands of mostly KGVI and QEII era Pre-Decimal stamps off paper in carton. 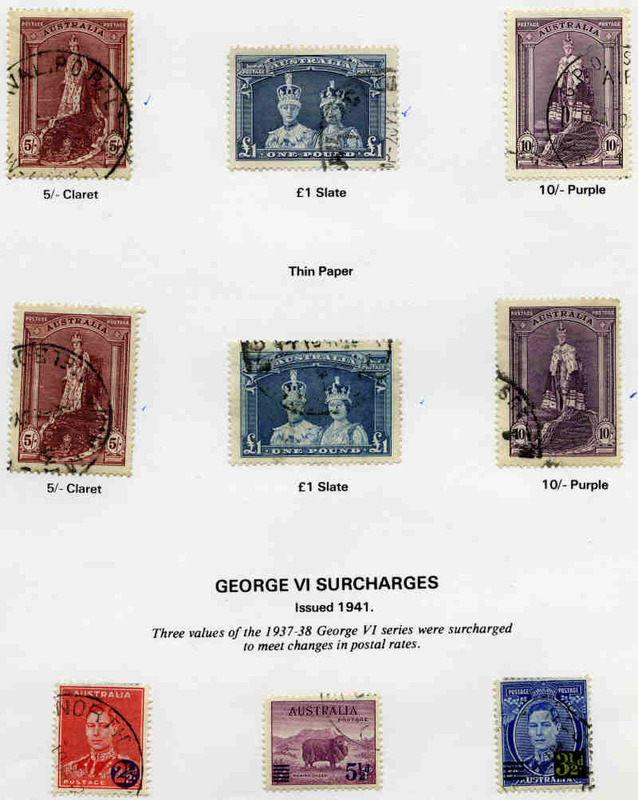 Accumulation of tens of thousands of mostly KGVI and QEII era Pre-Decimal stamps off paper in carton. Also on paper accumulation in small carton. Accumulation of 54kg of mainly modern close cut on paper mixture on single paper. 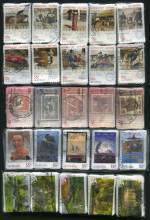 Mostly commemorative issues. Accumulation of 37kg of mainly modern close cut on paper mixture on single paper. 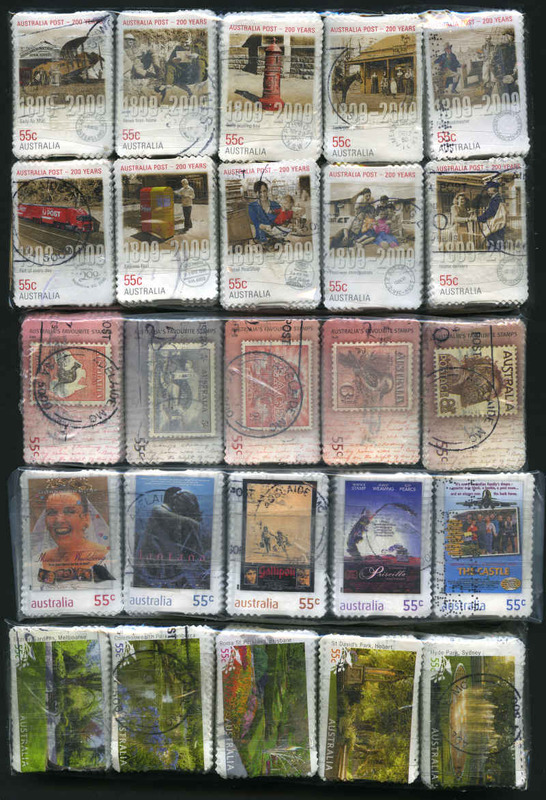 Mostly commemorative issues. 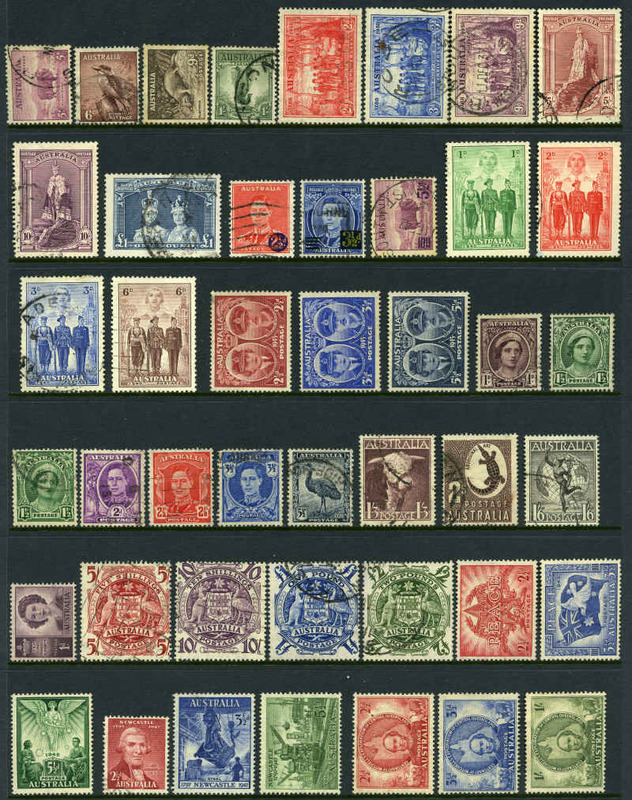 Accumulation of 18.5kg of mainly modern on paper mixture including some earlier content, plus small range of Pre-Decimal and Foreign stamps. 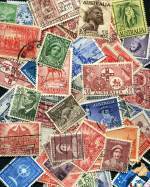 Also accumulation of many thousands of mostly Decimal stamps off paper in shoebox. Accumulation of 9.5kg of mostly modern on paper mixture including some off paper content in wine carton. Accumulation of 10kg of Decimal on paper mixture. Also Great Britain album containing collection of First Day Covers from 1969 to 1988. Accumulation of 24kg of mostly modern on paper mixture, some on large piece. 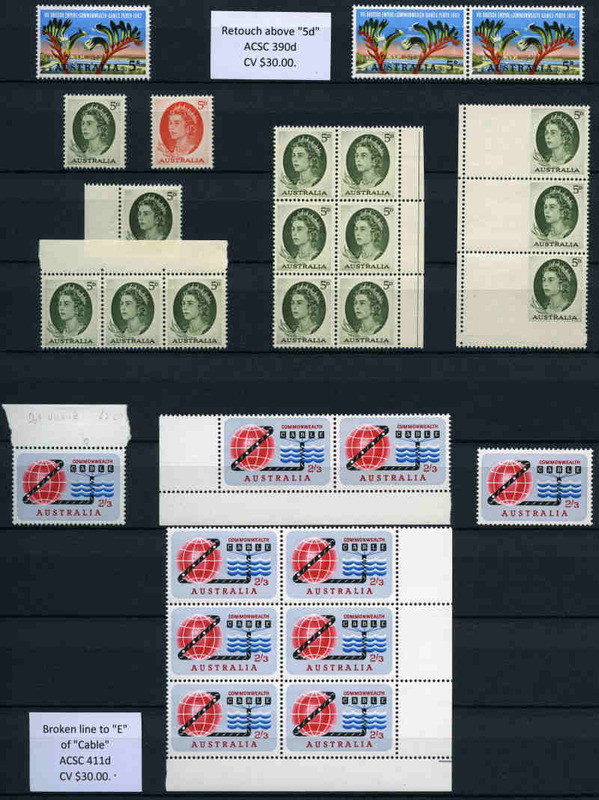 Also accumulation of many thousands of used Decimal stamps off paper in shoebox with some Pre-Decimal content. Accumulation of 18.5kg of modern on paper mixture. Mainly Definitive issues, but some commemorative content. Accumulation of 20kg of on paper mixture, some on large piece. Some early Decimal and Foreign content. Accumulation of 12kg of modern on paper mixture. Accumulation of 29.5kg of on paper mixture. Strength in 45c era with some later content and the odd higher value. Large carton of on paper mixture from a range of periods with some light foreign content. Main strength in Decimal, but includes some Pre-Decimal. Also shoebox of used stamps off paper. Accumulation of 7.5kg of on paper mixture. A good portion of recent material, but also includes a range of earlier Decimal period, some higher value and Foreign content. Also accumulation of many thousands of Australian and Foreign off paper mixture, plus bundle of covers. Accumulation of 13.5kg of on paper mixture. 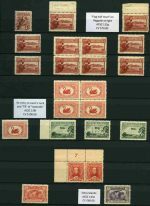 A good portion of recent material, but also includes a range of earlier Decimal period, some higher value and Foreign content. Also Accumulation of many thousands of Australian and Foreign off paper mixture. Accumulation of 11kg of modern on paper mixture. Mainly 55¢ issues with a good proportion of commemoratives and some earlier content. Accumulation of 11kg of close cut mainly modern on paper mixture on single paper. Light content of earlier issues.